Surprise! We are finally at the last of the Anatidae Family of Ducks, Geese, and Swans. There are 31 left, and today we will reveal the rest of them. There is a total of 173 species in this family. Trust you didn’t mind them being divided into different articles [in taxonomic order]. A list of the whole series of these avian wonders is at the end of the article. 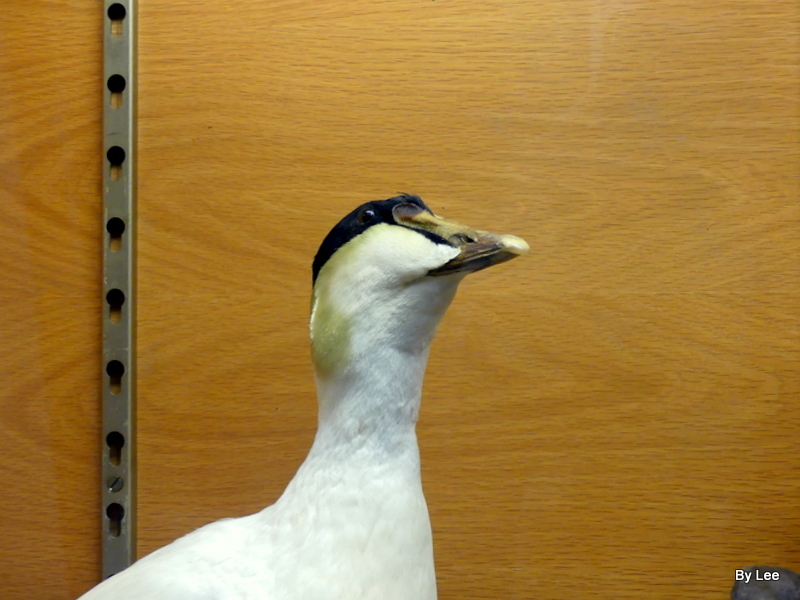 Today, we start off with four Eiders that are in two genera. They are the Steller’s Eider (Polysticta stelleri), Spectacled Eider (Somateria fischeri), and the King Eider (Somateria spectabilis), Common Eider (Somateria mollissima).What are an interesting looking group. 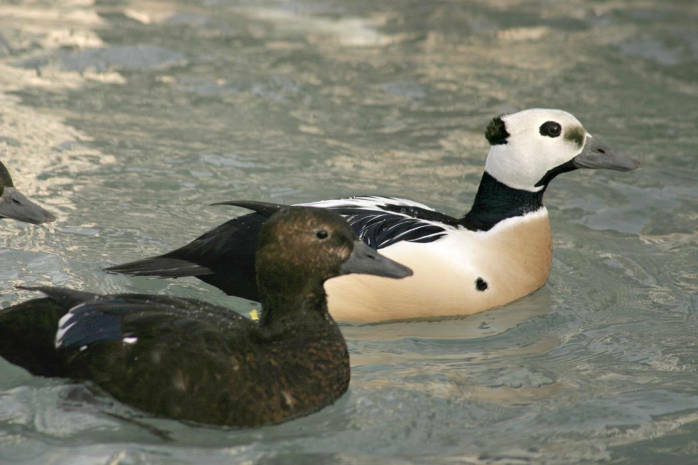 Steller’s Eider (Polysticta stelleri)is the smallest eider at 45 cm (18 in) long. The male is unmistakable with his white head marked by a thick black eye ring and greenish-black tufts of feathers on the forehead and the back of the head. Chin, throat and neck are also black, as are the back, tail, and rump. Wings are dark bluish-purple with white edging. When folded, they give a striped appearance across the back. The speculum is metallic blue bordered with white. 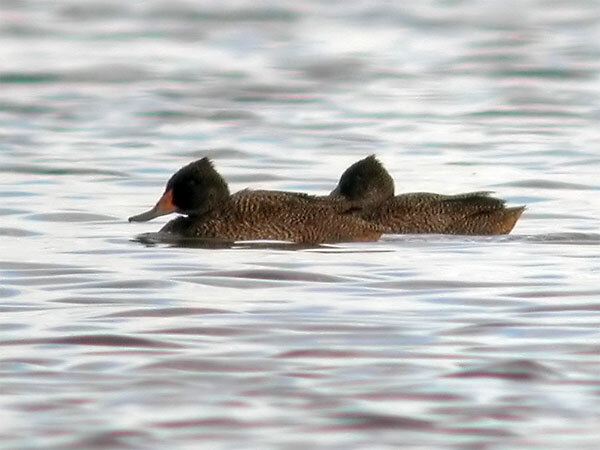 The breast and flanks are cinnamon-buff marked with a black spot on each side just above the waterline. Legs, feet and bill are dark bluish-grey. 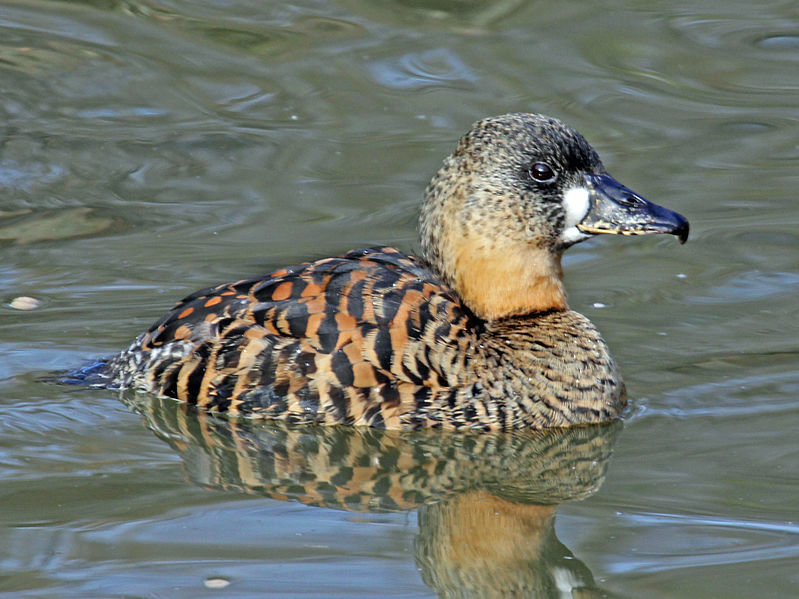 The female is a dark brown bird, smaller with a more typically duck-shaped head and body than other eider species. 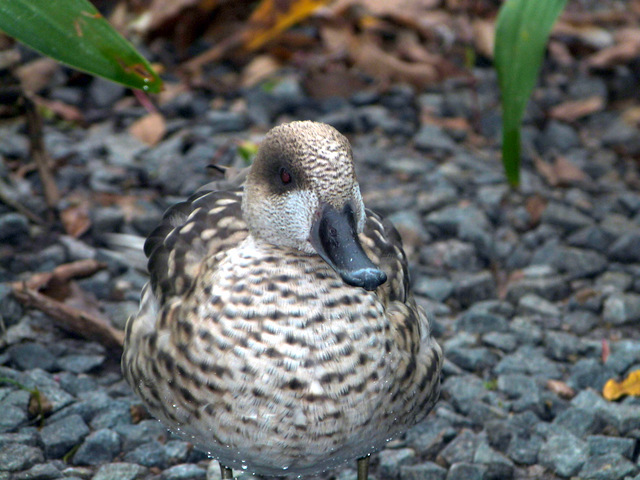 The Eider genus, Somateria, are large seaducks . The scientific name is derived from Ancient Greek somatos “body” and erion “wool”, referring to eiderdown. They all breed in the cooler latitudes of the Northern Hemisphere. 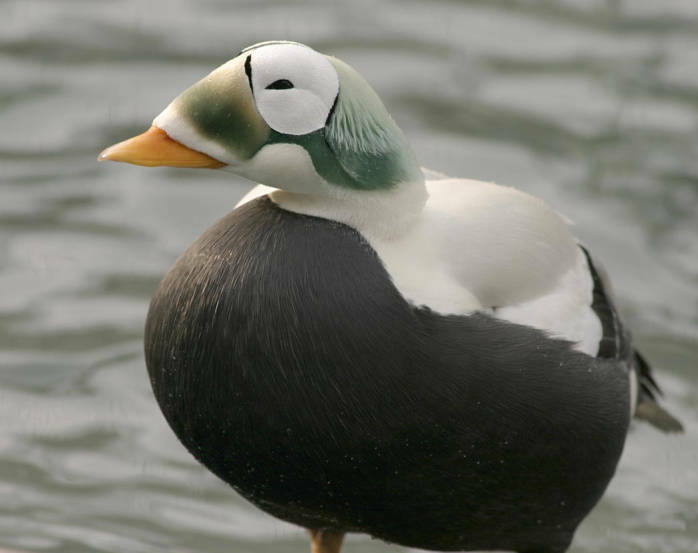 The down feathers of eider ducks, and some other ducks and geese, are used to fill pillows and quilts—they have given the name to the type of quilt known as an eiderdown. As you will see as we continue through the rest of these swimming critters, the variety of design, color, shapes, and provisions for them. What a Creator! 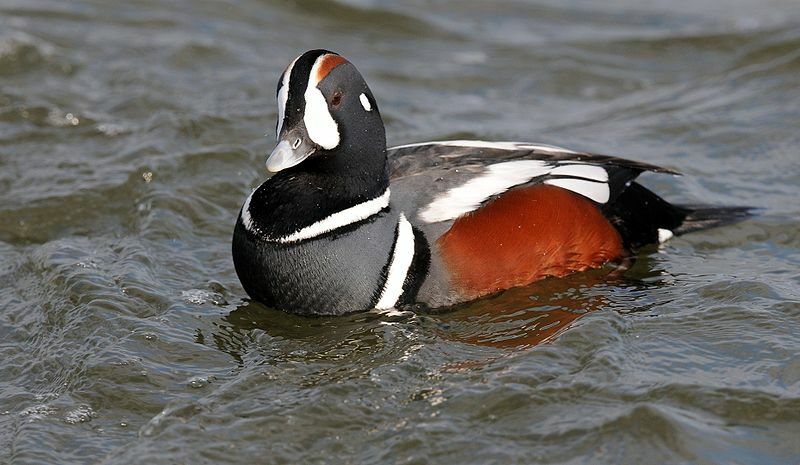 The Harlequin Duck (Histrionicus histrionicus) is a small sea duck. It takes its name from Harlequin (French Arlequin, Italian Arlecchino), a colourfully dressed character in Commedia dell’arte. The species name comes from the Latin word “histrio”, “actor”. In North America it is also known as lords and ladies. 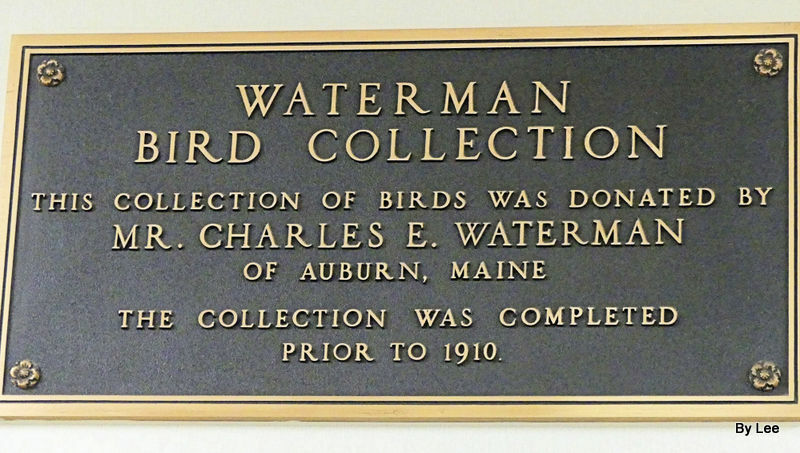 Other names include painted duck, totem pole duck, rock duck, glacier duck, mountain duck, white-eyed diver, squeaker and blue streak. 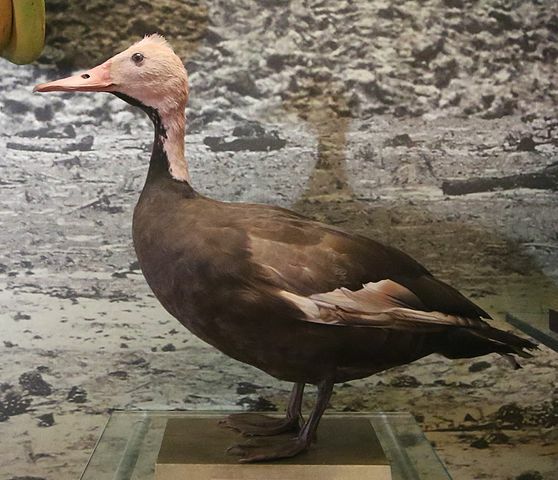 The Labrador Duck (Camptorhynchus labradorius) is an extinct North American bird; it has the dubious distinction of being the first endemic North American bird species to become extinct after the Columbian Exchange. 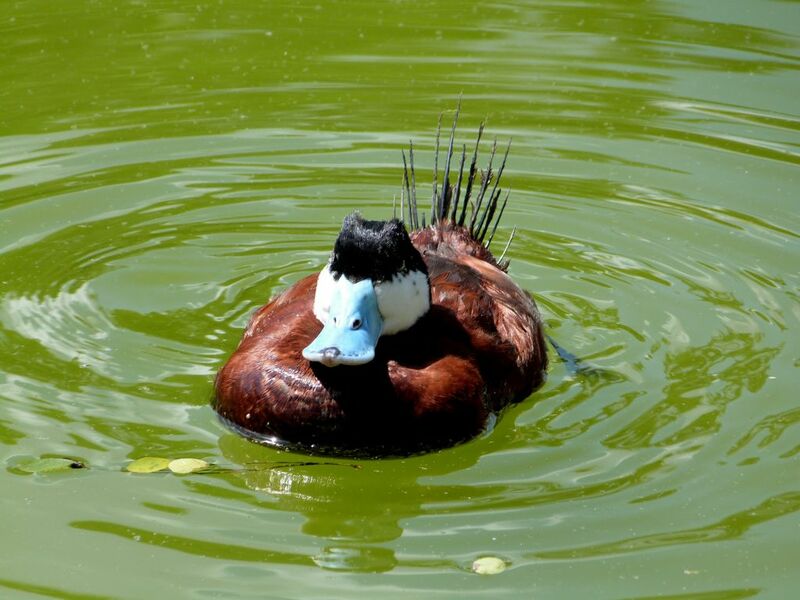 It was already a rare duck before European settlers arrived, and became extinct shortly after. 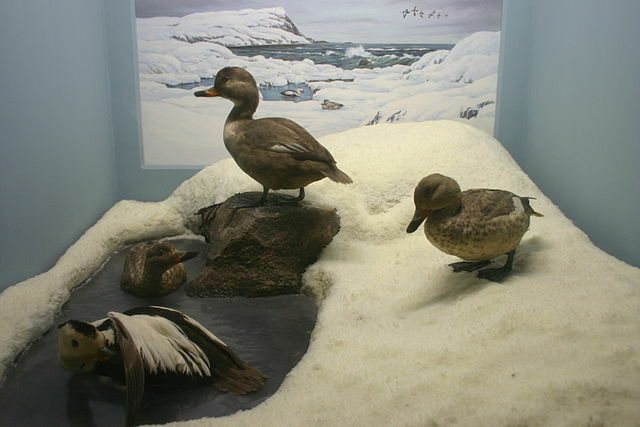 As a result of its rarity, information on the Labrador duck is not abundant, but some, such as its habitat, characteristics, dietary habits, and reasons behind extinction, are known. 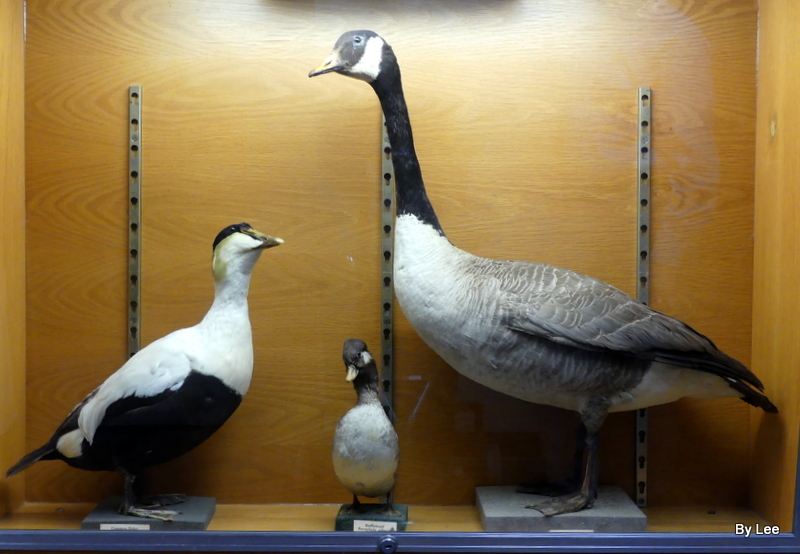 Specimens of the Labrador duck are preserved in museum collections worldwide. They are stocky seaducks. 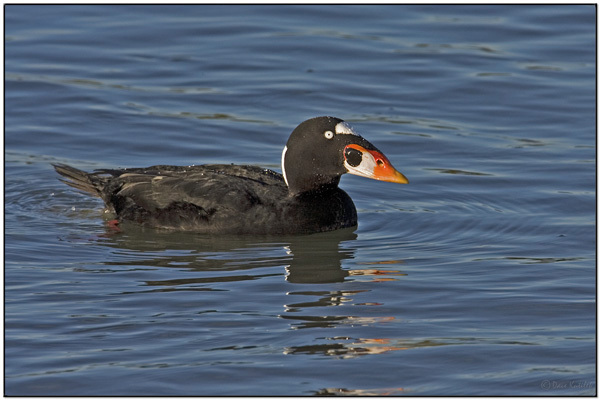 The drakes are mostly black and have swollen bills. Females are brown. 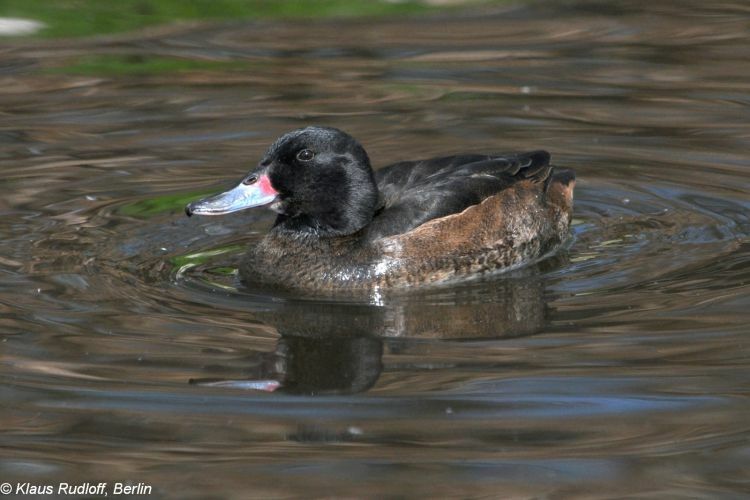 The genus name is derived from Ancient Greek melas “black” and netta “duck”. They breed in the far north of Europe, Asia, and North America, and winter farther south in temperate zones of those continents. 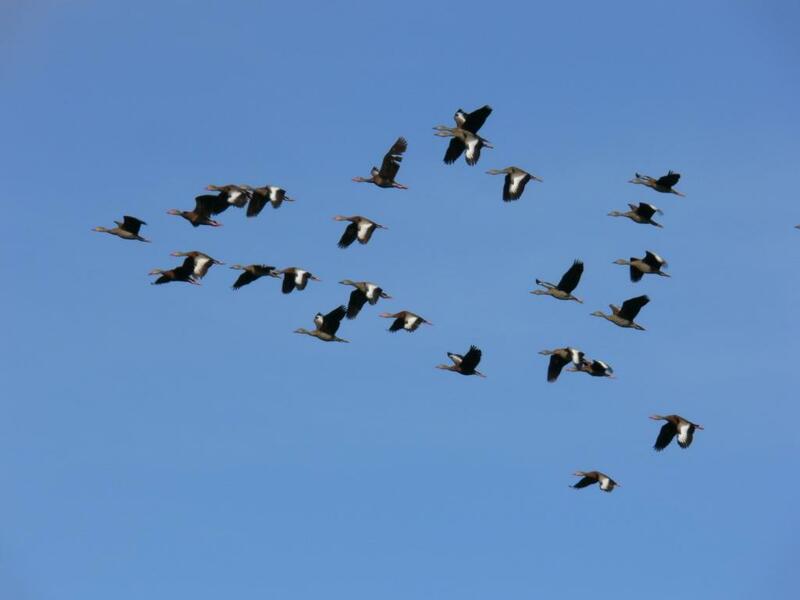 They form large flocks on suitable coastal waters. These are tightly packed, and the birds tend to take off together. 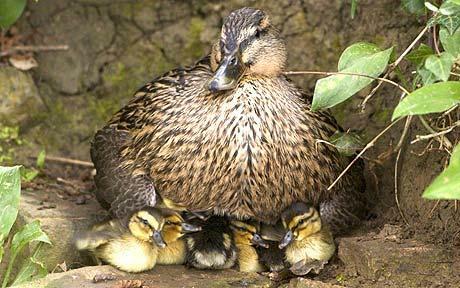 Their lined nests are built on the ground close to the sea, lakes or rivers, in woodland or tundra. These species dive for crustaceans and molluscs. 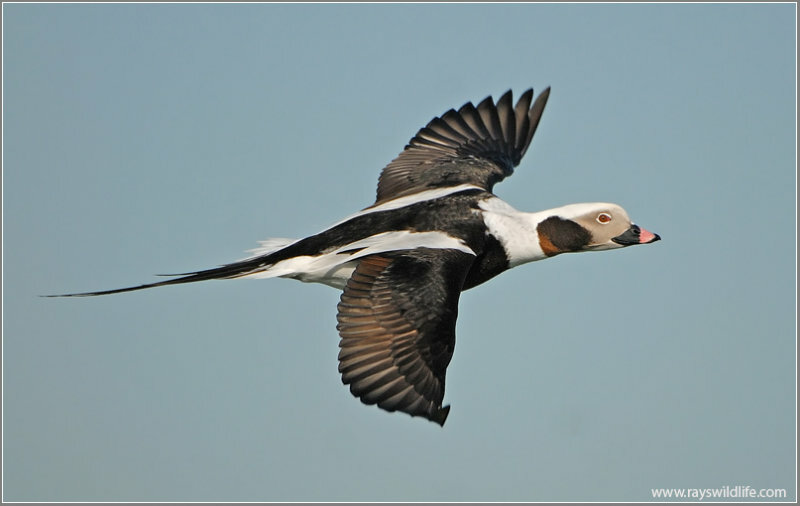 Long-tailed Duck (Clangula hyemalis), once known as oldsquaw, is a medium-sized sea duck. Their breeding habitat is in tundra pools and marshes, but also along sea coasts and in large mountain lakes in the North Atlantic region, Alaska, northern Canada, northern Europe, and Russia. The nest is located on the ground near water; it is built using vegetation and lined with down. They are migratory and winter along the eastern and western coasts of North America, on the Great Lakes, coastal northern Europe and Asia, with stragglers to the Black Sea. The most important wintering area is the Baltic Sea, where a total of about 4.5 million gather. Smew (Mergellus albellus) – The drake smew, with its ‘cracked ice’ and ‘panda’ appearance, is unmistakable, and looks very black-and-white in flight. 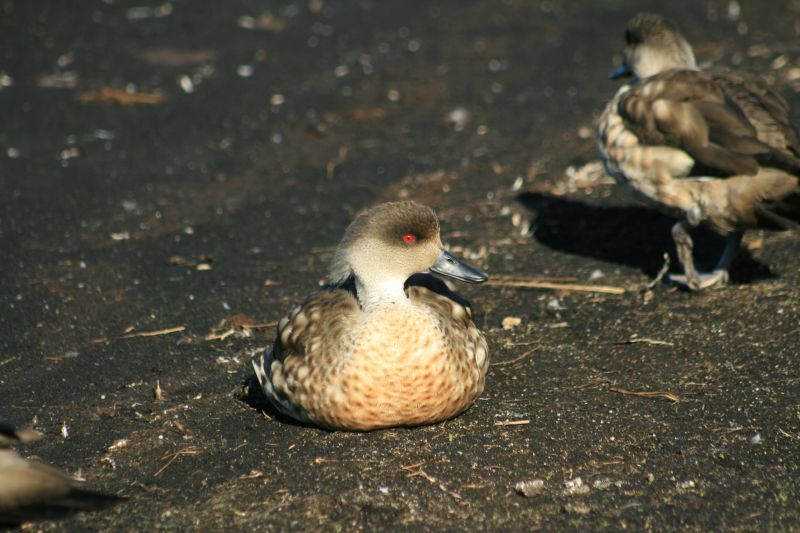 The females and immature males are grey birds with chestnut foreheads and crowns, and can be confused at a distance with the ruddy duck; they are often known as “redhead” smew. 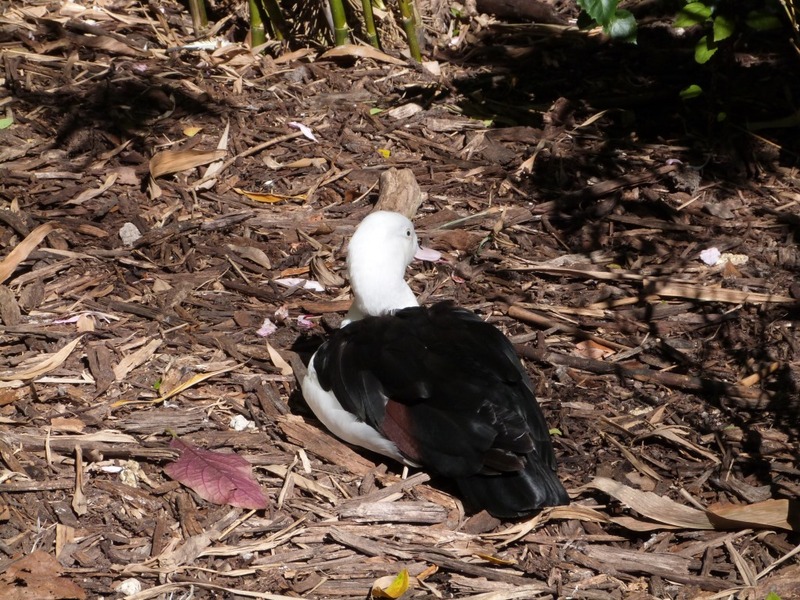 It has oval white wing-patches in flight. 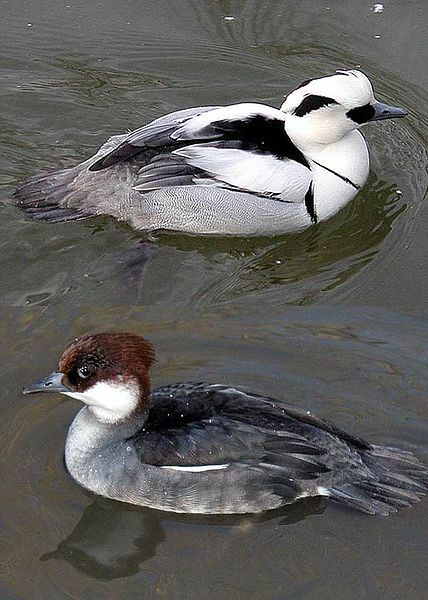 The smew’s bill has a hooked tip and serrated edges, which help it catch fish when it dives for them. Hooded Merganser (Lophodytes cucullatus) is a species of small duck. It is the only extant species in the genus Lophodytes. The bird is striking in appearance; both sexes have crests that they can raise or lower, and the breeding plumage of the male is handsomely patterned and coloured. 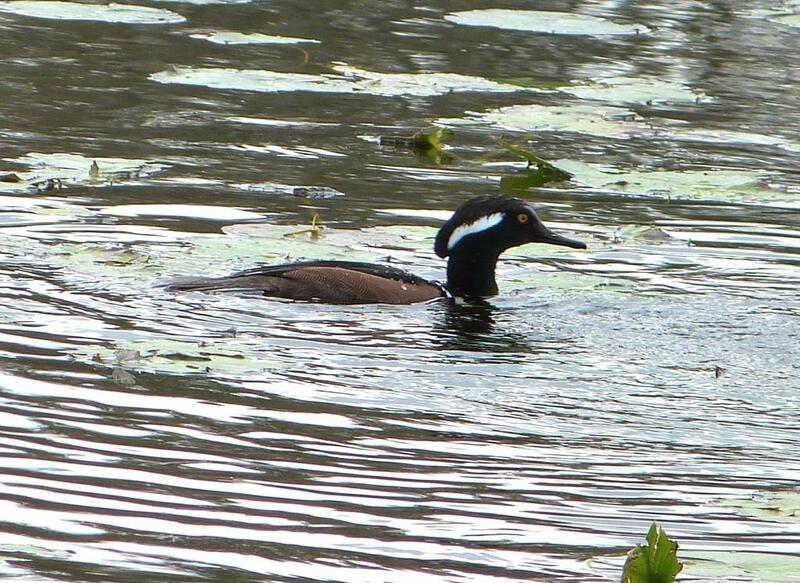 The hooded merganser has a sawbill but is not classified as a typical merganser. 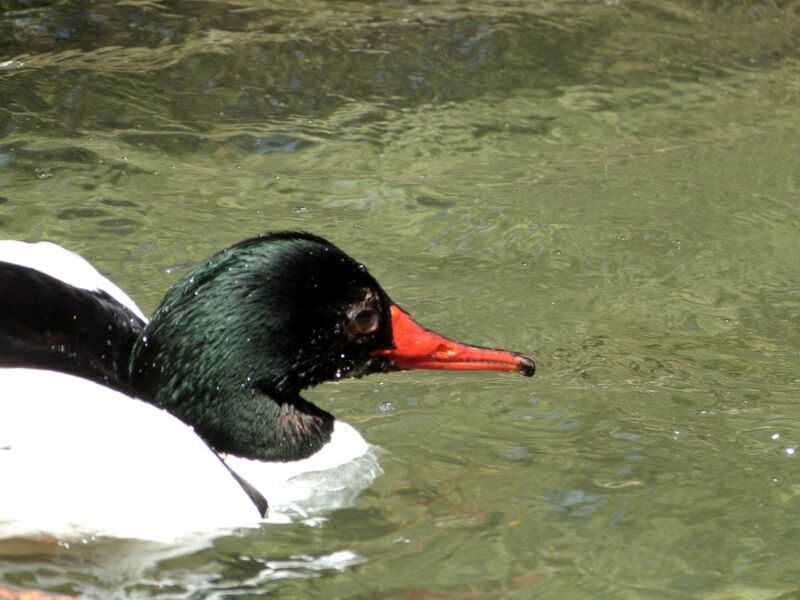 Although they are seaducks, most of the mergansers prefer riverine habitats, with only the red-breasted merganser being common at sea. These large fish-eaters typically have black-and-white, brown and/or green hues in their plumage, and most have somewhat shaggy crests. All have serrated edges to their long and thin bills that help them grip their prey. 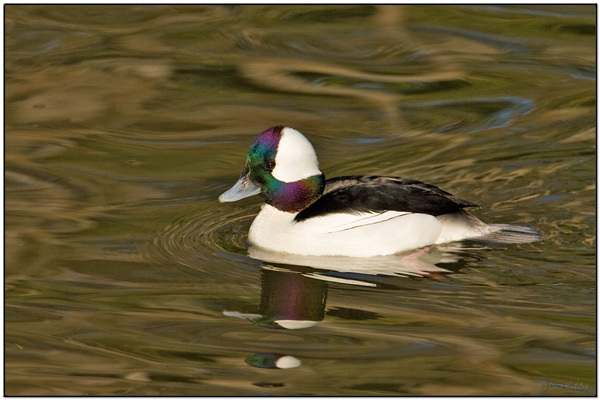 Along with the Smew and Hooded Merganser, they are therefore often known as “sawbills“. The Black-headed Duck (Heteronetta atricapilla) is a South American duck allied to the stiff-tailed ducks in the subfamily Oxyurinae of the family Anatidae. It is the only member of the genus Heteronetta. This is the most basal living member of its subfamily, and it lacks the stiff tail and swollen bill of its relatives. 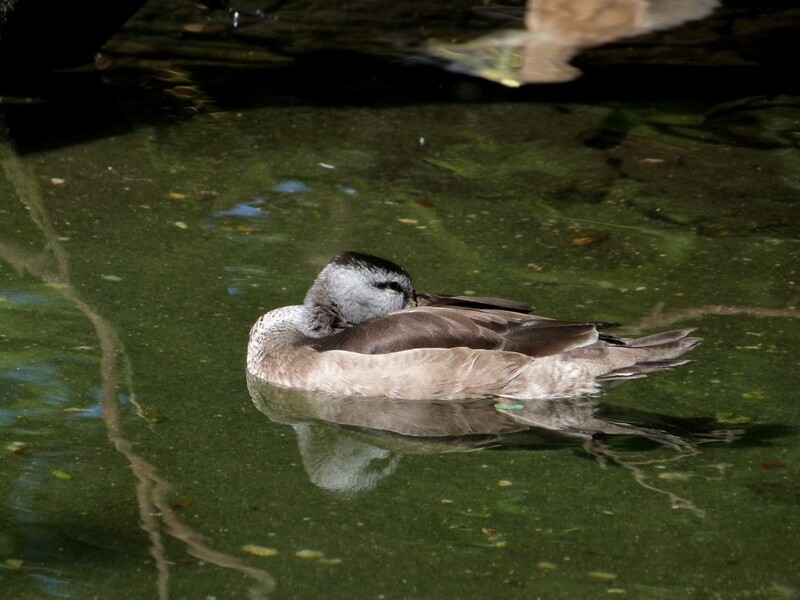 Masked Duck (Nomonyx dominicus) is a tiny stiff-tailed duck ranging through the tropical Americas. They are found from Mexico to South America and also in the Caribbean. 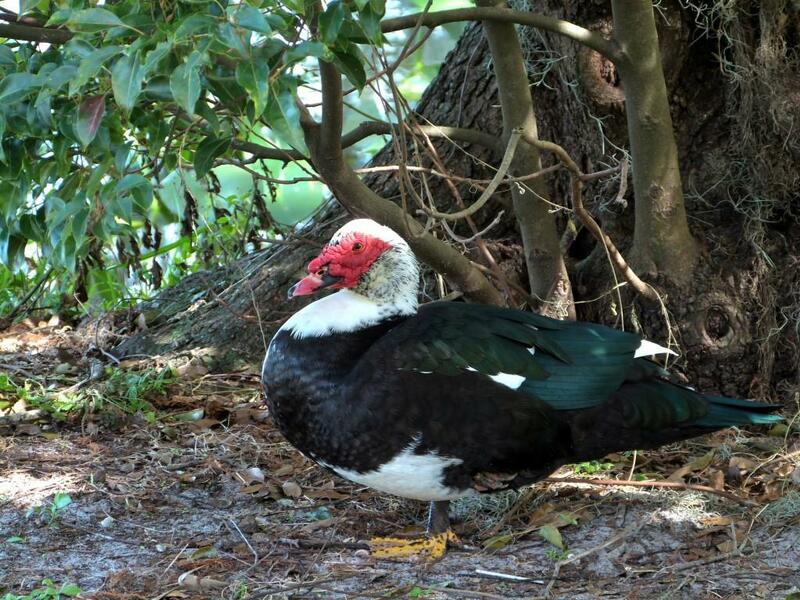 Primarily not migratory, masked ducks are reported as very uncommon vagrants in the southernmost United States, along the Mexican border and in Florida. 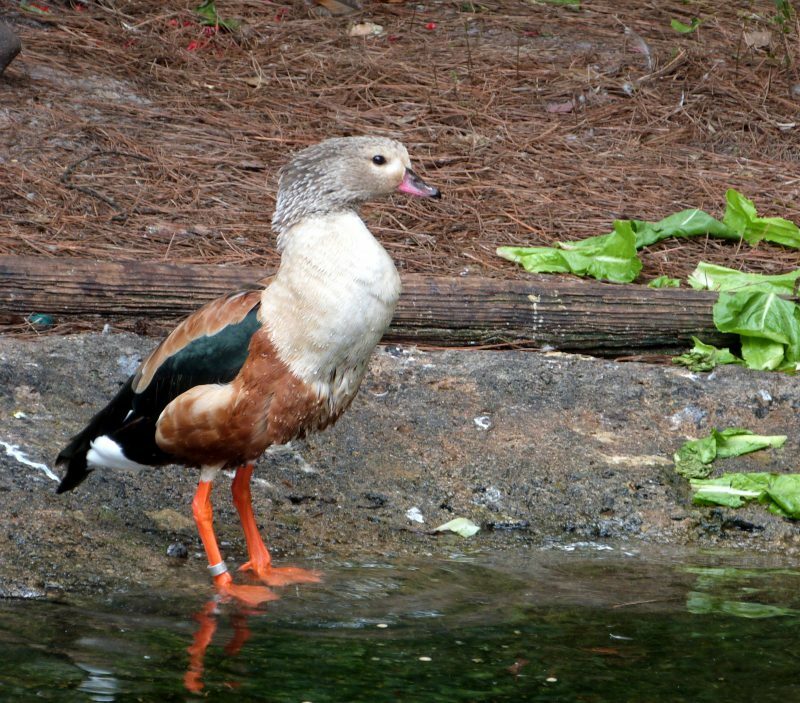 These ducks mainly feed on seeds, roots, and leaves of aquatic plants. They also eat aquatic insects and crustaceans. They feed by diving. 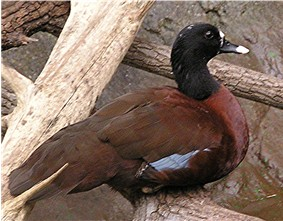 The Oxyura genus has 6 Ducks, the Ruddy Duck (Oxyura jamaicensis), Andean Duck (Oxyura ferruginea), Lake Duck (Oxyura vittata), Blue-billed Duck (Oxyura australis), Maccoa Duck (Oxyura maccoa), and the White-headed Duck (Oxyura leucocephala). The Musk Duck (Biziura lobate) is a highly aquatic, stiff-tailed duck native to southern Australia. It is the only living member of the genus Biziura. This animal derives its common name from the peculiar musky odour it emanates during the breeding season. 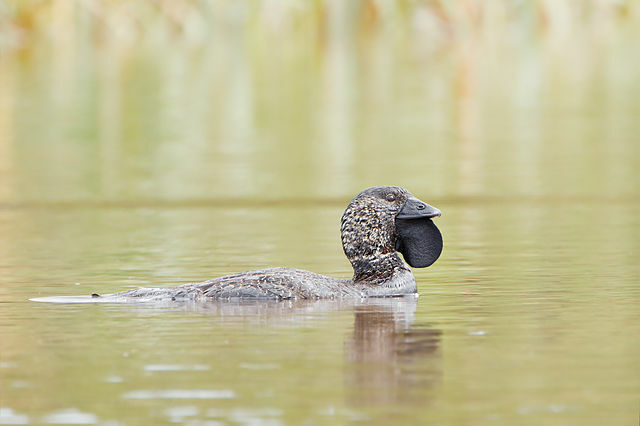 Musk ducks are moderately common through the Murray-Darling and Cooper Creek basins, and in the wetter, fertile areas in the south of the continent: the southwest corner of Western Australia, Victoria, and Tasmania. Today we will continue through the Anatidae family of Ducks, Geese, Swans and allies. 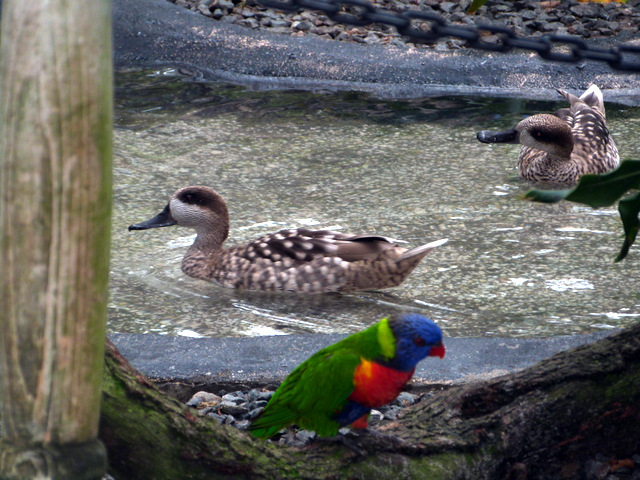 We start off with these neat Marbled Ducks that greet us when we visit the Parakeet Plus Aviary at Lowry Park Zoo in Tampa, FL. 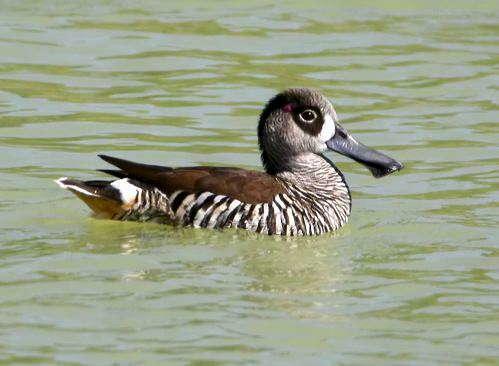 “Netta is a genus of diving ducks. 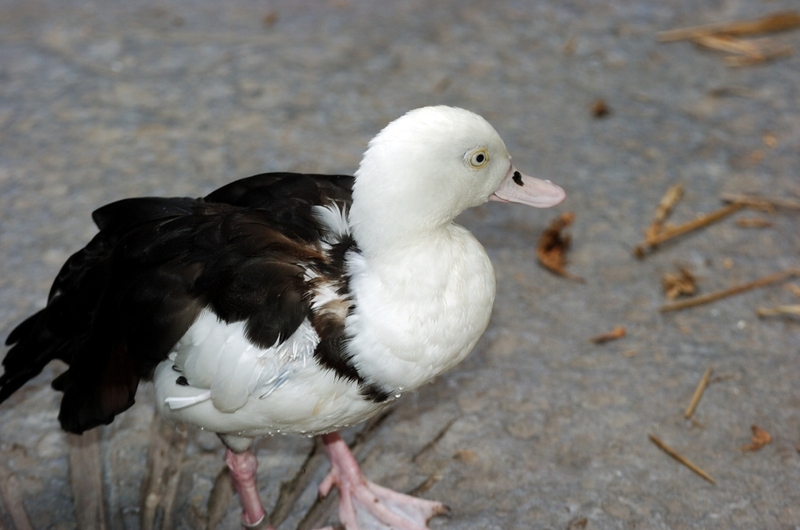 The name is derived from Greek Netta “duck”. 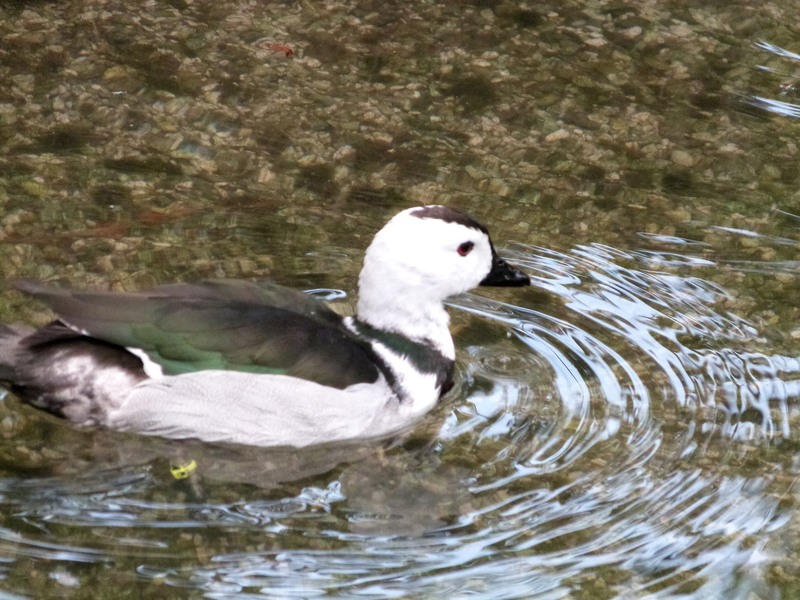 Unlike other diving ducks, the Netta species are reluctant to dive, and feed more like dabbling ducks. These are gregarious ducks, mainly found on fresh water. They are strong fliers; their broad, blunt-tipped wings require faster wing-beats than those of many ducks and they take off with some difficulty. “How Can I Keep Singing” ~ The 3+1 Trio (Pastor Jerry, Reagan Osborne, Caleb and Jessie Padgett)”. 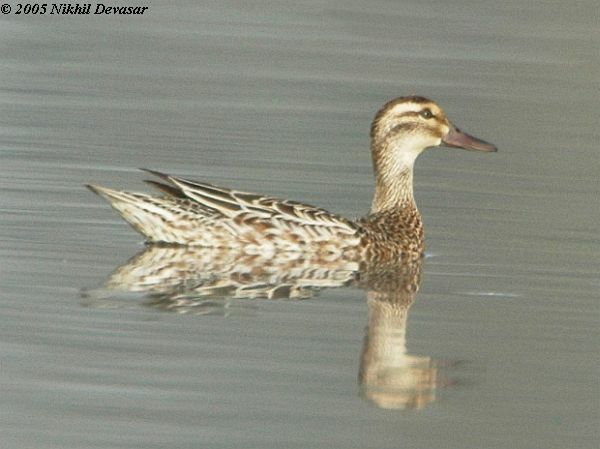 Today’s group of members from the “Ducks Plus” family, the Anatidae, are all from one Genus. 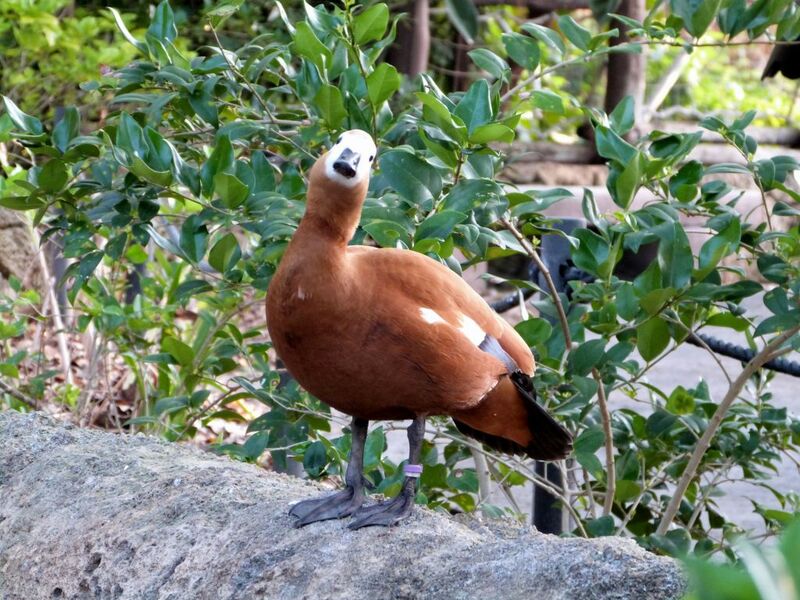 The Anas according to Wikionary is: ” A taxonomic genus within the family Anatidae – various species of dabbling duck. 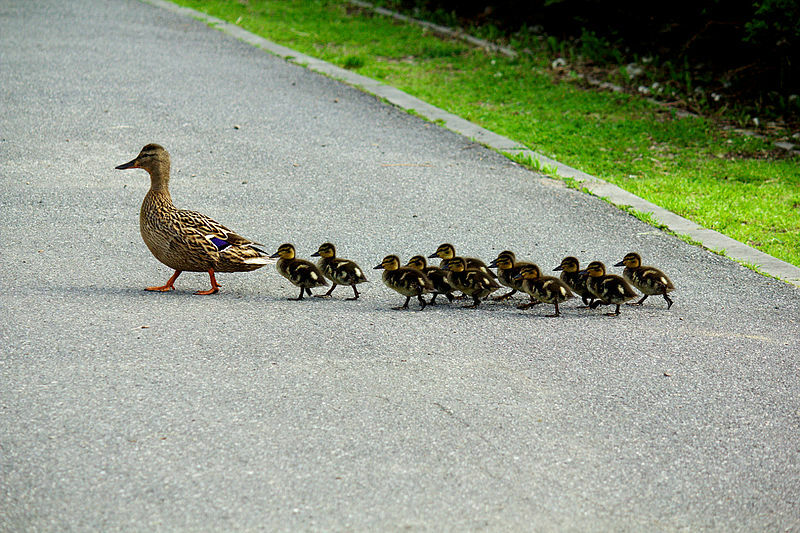 These are probably the most common group of ducks many of us see. 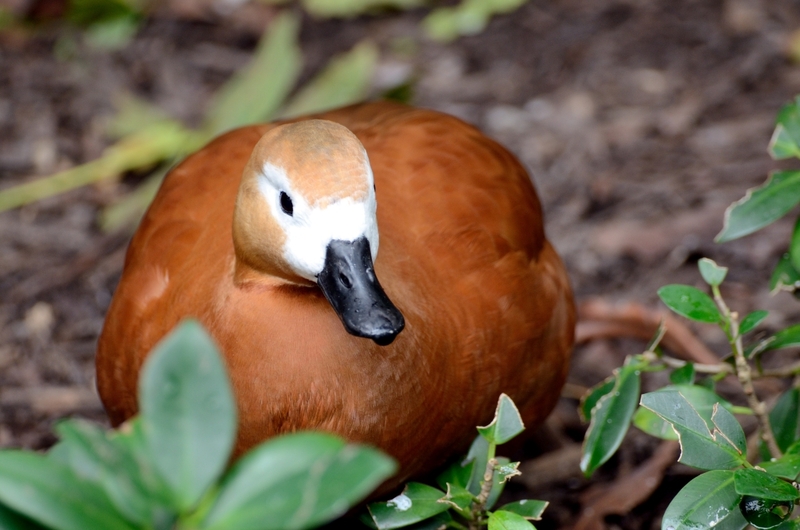 The genus name is the Latin for “duck”. 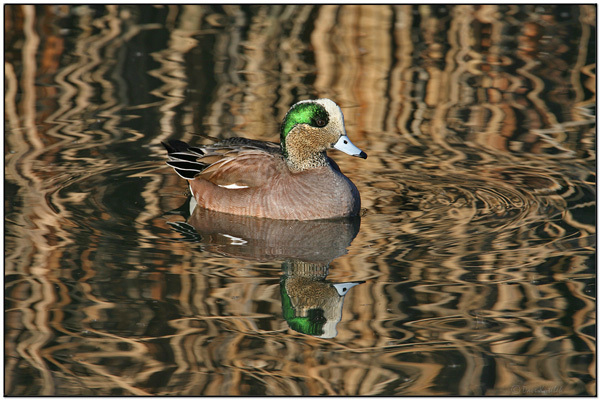 It includes mallards, wigeons, teals, pintails and shovelers in a number of subgenera. 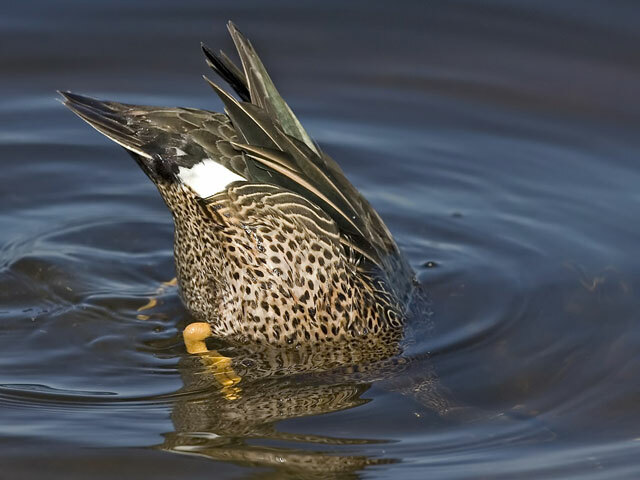 “Dabbling” is where the duck upends itself to feed. They feed mainly on water plants, which they obtain by tipping-up in shallows—uncommonly by diving (with opened wings); they often forage near the shore for seeds and insects. The bill is flat and broad, the hindtoe unlobed. Dabbling ducks float high in the water and are swift fliers, leaping upward on noisy wings before attaining level flight, usually in compact flocks. The mallard (/ˈmælɑːrd/ or /ˈmælərd/) or wild duck (Anas platyrhynchos) is a dabbling duck which breeds throughout the temperate and subtropical Americas, Europe, Asia, and North Africa, and has been introduced to New Zealand, Australia, Peru, Brazil, Uruguay, Argentina, Chile, the Falkland Islands and South Africa. 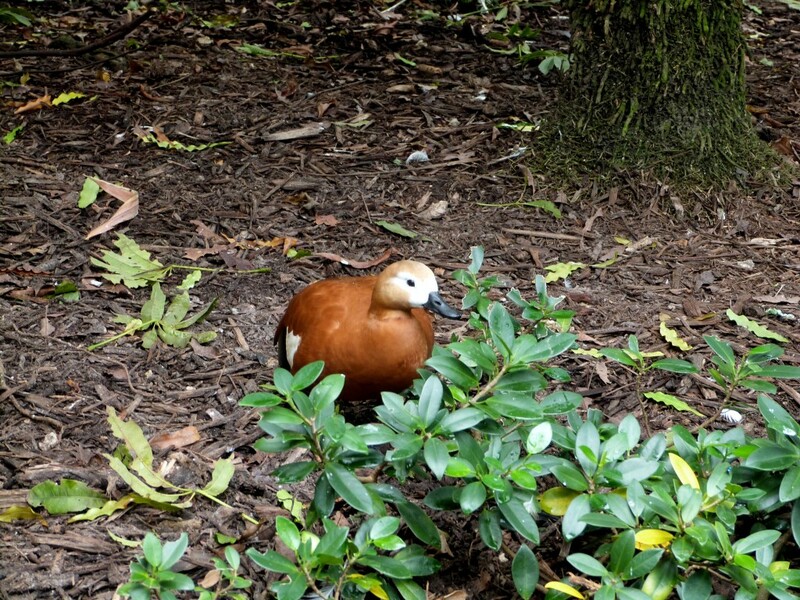 This duck belongs to the subfamily Anatinae of the waterfowl family Anatidae. The mallard was one of the many bird species originally described by Carl Linnaeus in his 18th-century work Systema Naturae, and still bears its original binomial name. 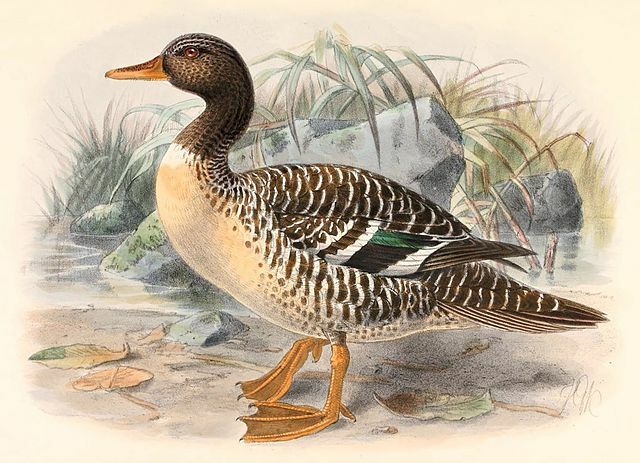 The scientific name is from Latin Anas, “duck” and Ancient Greek platyrhynchus , “broad-billed” ( from platus, “broad” and rhunkhos, ” bill”). But the Mallard is not the only duck in this genus, Anas. There are 48 others. As mentioned, much interbreeding has taken place, and eventually these were raised to species status. After showing you the Wood Ducks last week, their is another beauty from the Lord in this week’s group. 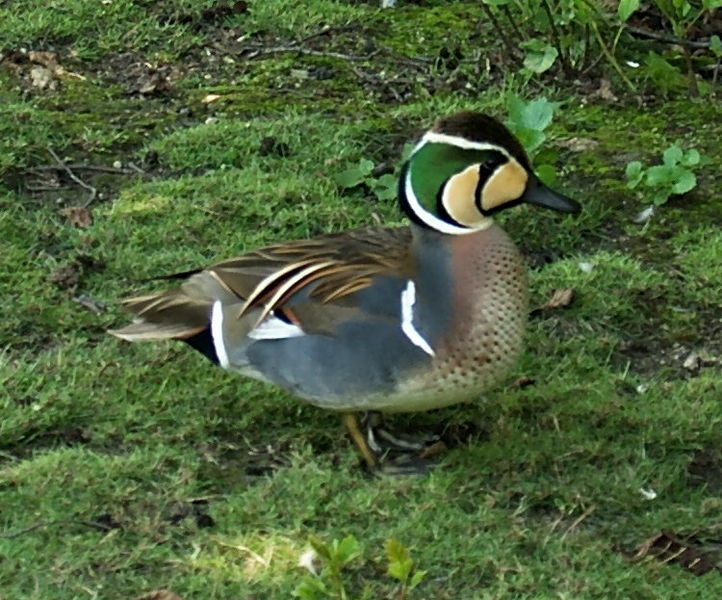 We have seen this Teal, but not in that breeding outfit. 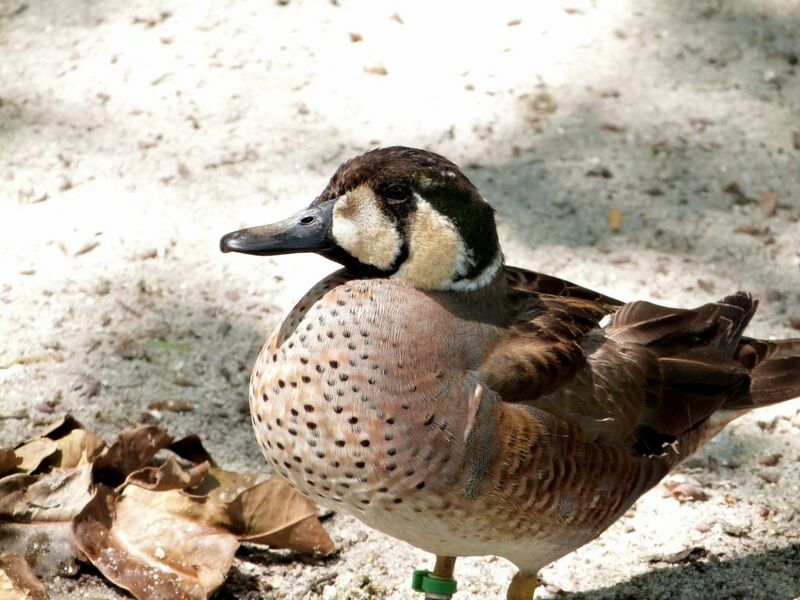 Teals do not totally submerge when feeding and are often seen with just their rears showing as the search for food. 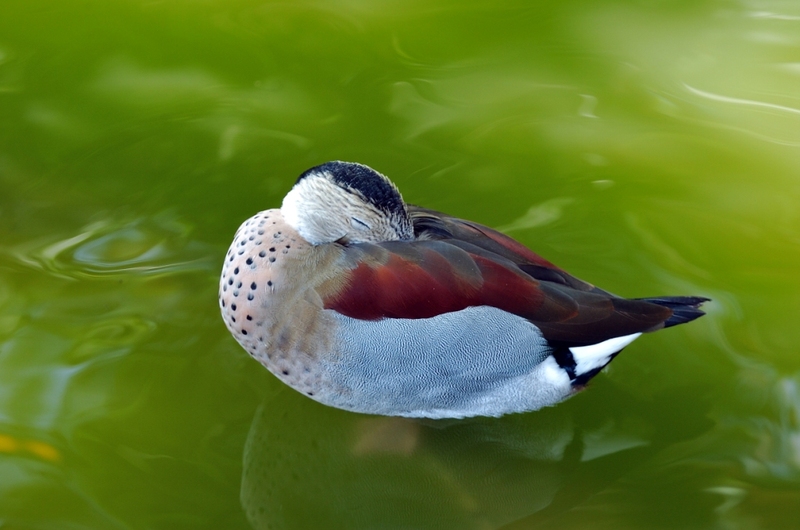 Because of their feeding method, teals are more buoyant than diving ducks. 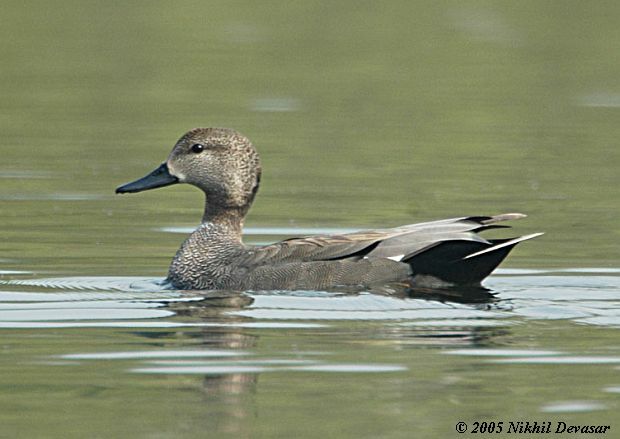 The gadwall is a quieter duck, except during its courtship display. 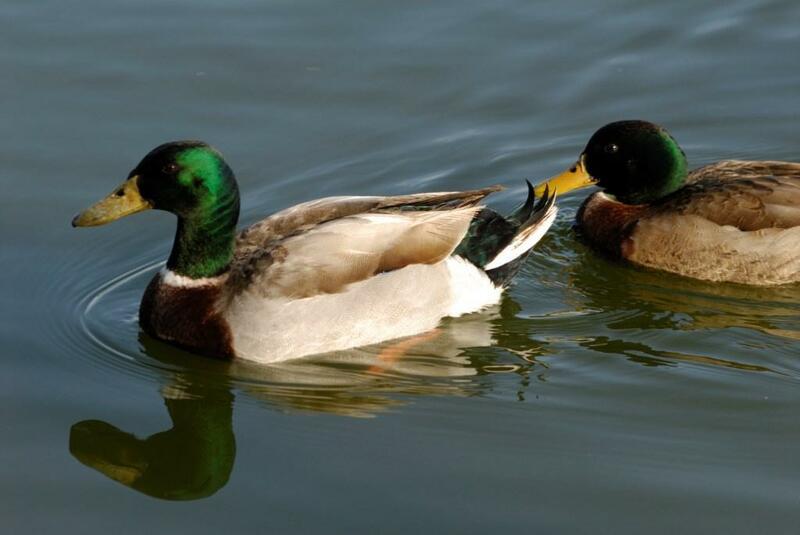 The male mallards (drakes) have a glossy green head and are grey on wings and belly, while the females (hens or ducks) have mainly brown-speckled plumage. 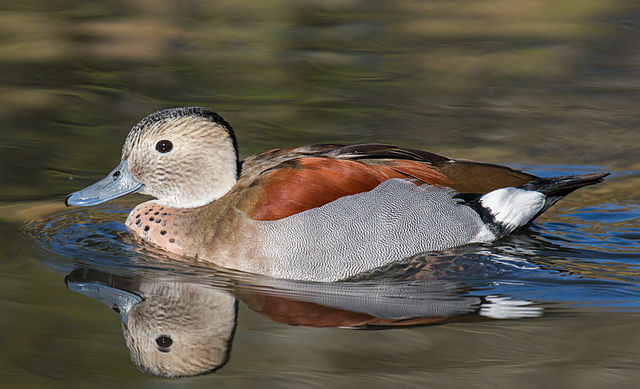 The wigeons are similarly shaped, with a steep forehead and bulbous rear to the head. 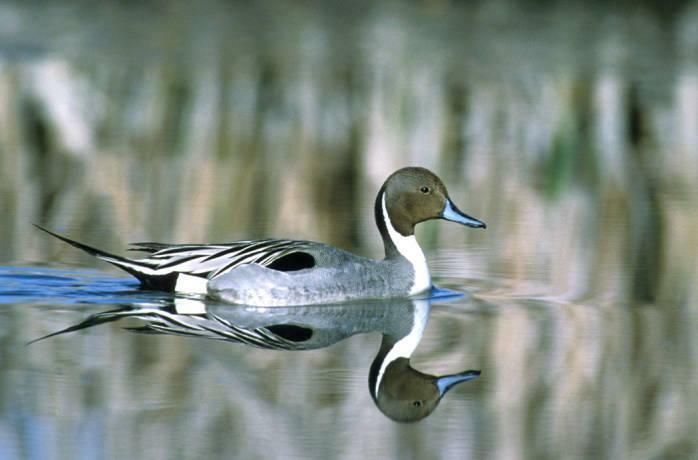 The Pintail is a large duck, and the male’s long central tail feathers give rise to the species’ English and scientific names. 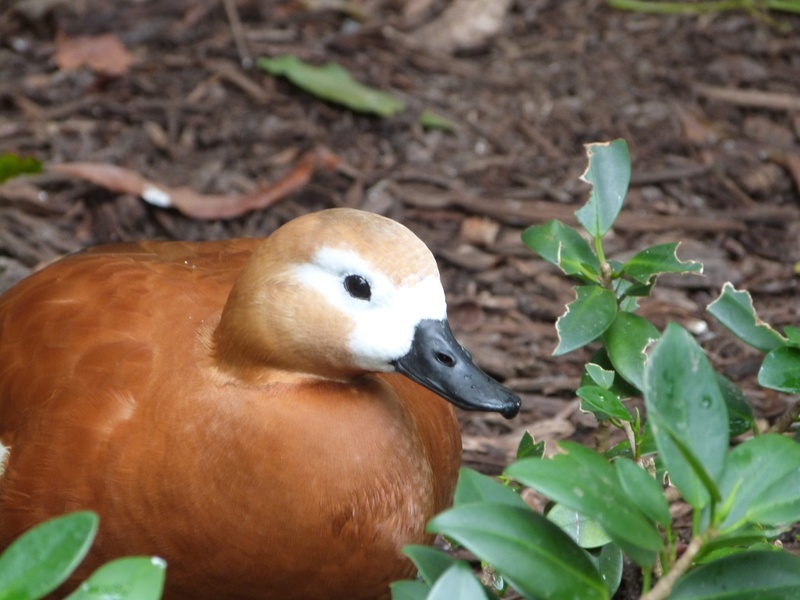 It’s Sunday and time for some more of the Anatidae Family. We have 18 more great swimmers for you to check out. 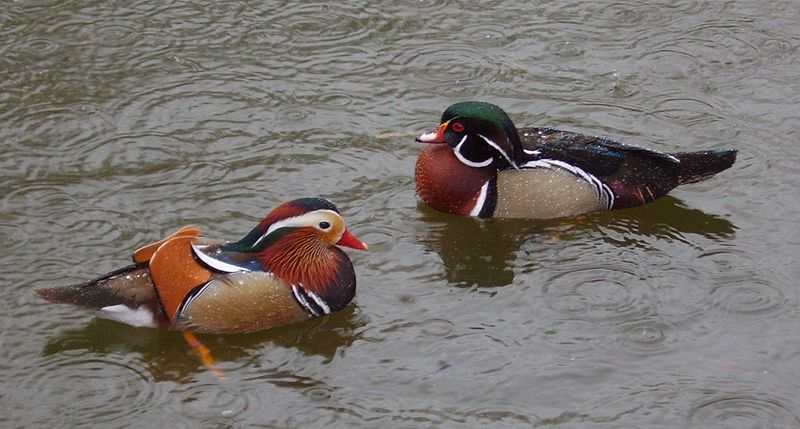 These are in 10 different genera, with 9 Ducks, 9 Geese and 2 sheldgeese. The Lord created all of these with shapes and colors, but they all love being in or near water. 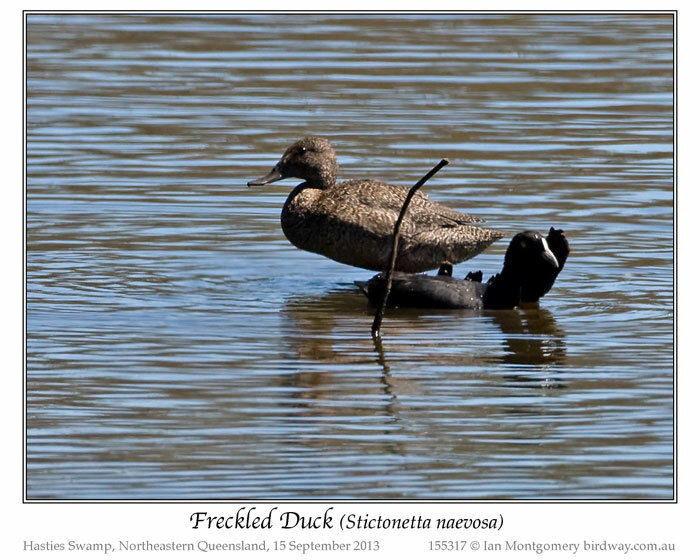 Freckled Duck (Stictonetta naevosa) – is a waterfowl species endemic to Australia and is among the rarest waterfowl in the world. 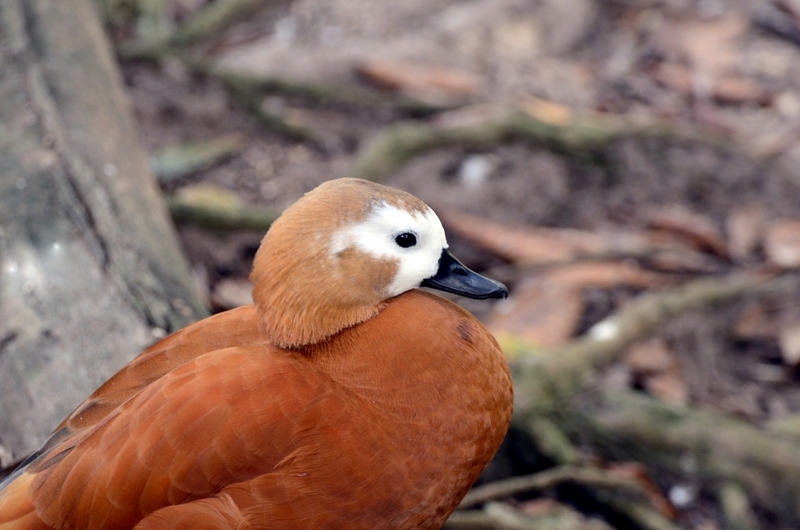 The freckled duck has also been referred to as the monkey duck or the oatmeal duck in English, Punktchenente in German, canard mouchete in French and pato manchado in Spanish. 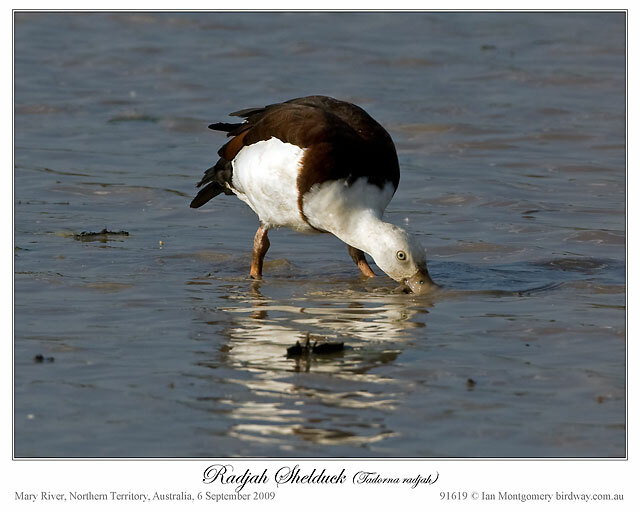 These birds are usually present in mainland Australia, but disperse to coastal and subcostal wetlands in the dry period. 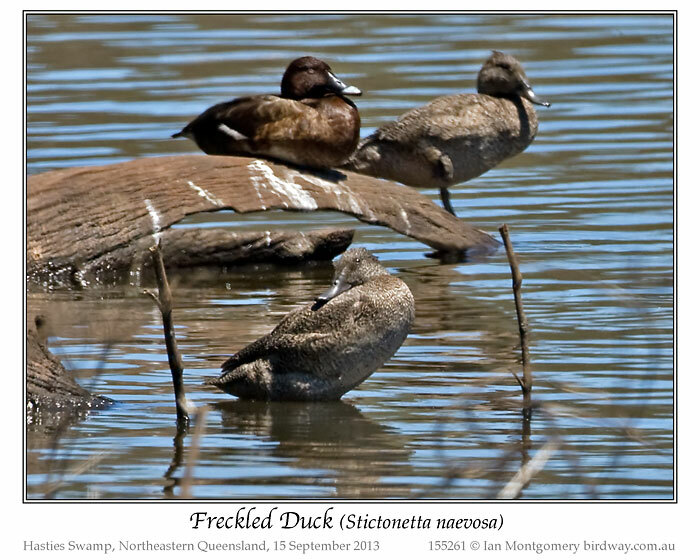 During such times it is common for the freckled duck population to congregate in flocks in the same area, giving the impression that they are more common than they really are. 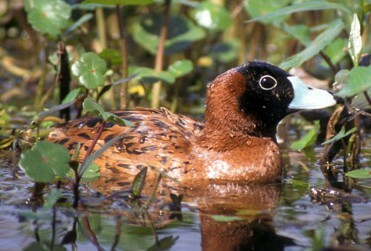 The freckled duck has a distinctive appearance. 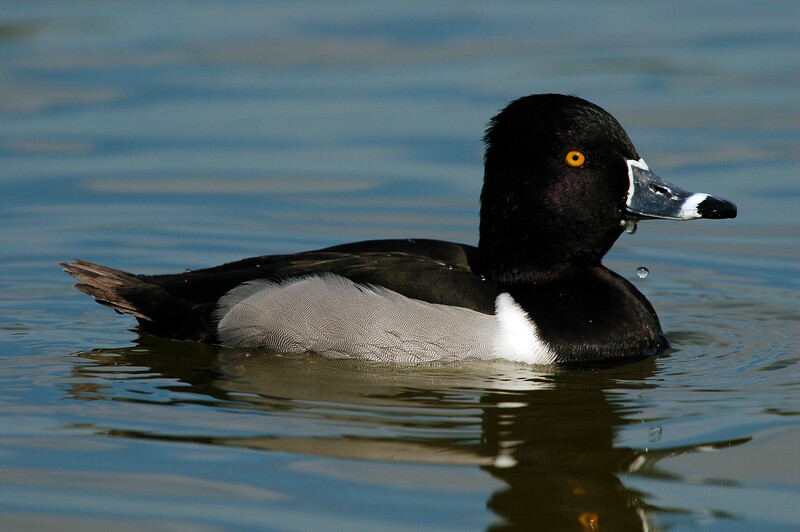 It is characterized, in adults, by dark grey to black plumage covered with small white flecks, which gives the duck the ‘freckled’ look. The feet, legs and bill of both sexes is of a slate grey color. Hatchlings and juveniles are distinguished by a uniform light grey plumage, which they lose around their 32nd week when they undergo a full body molt to assume the adult plumage. 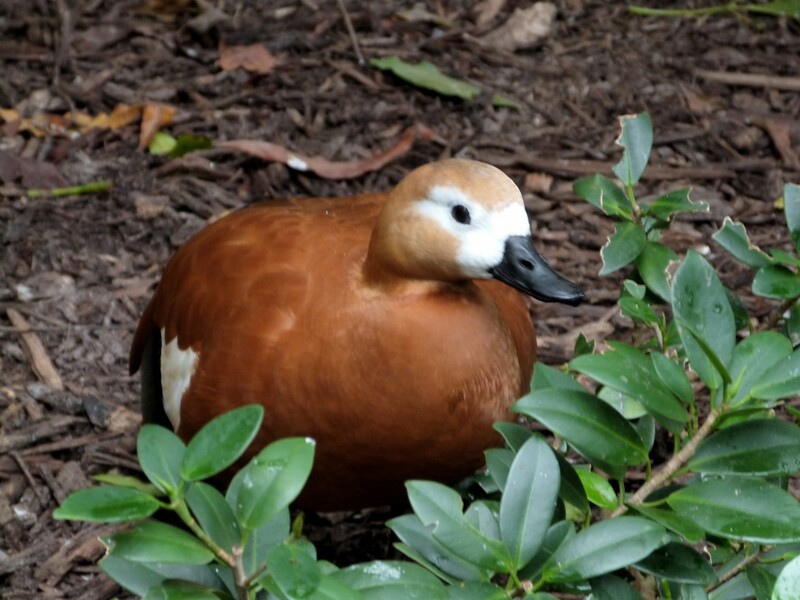 In the past few decades, several institutions have established breeding programs to aid in supplementation of the freckled duck population. and Zoo Miami is one of the ones in this program. We saw these on our latest trip to the zoo. 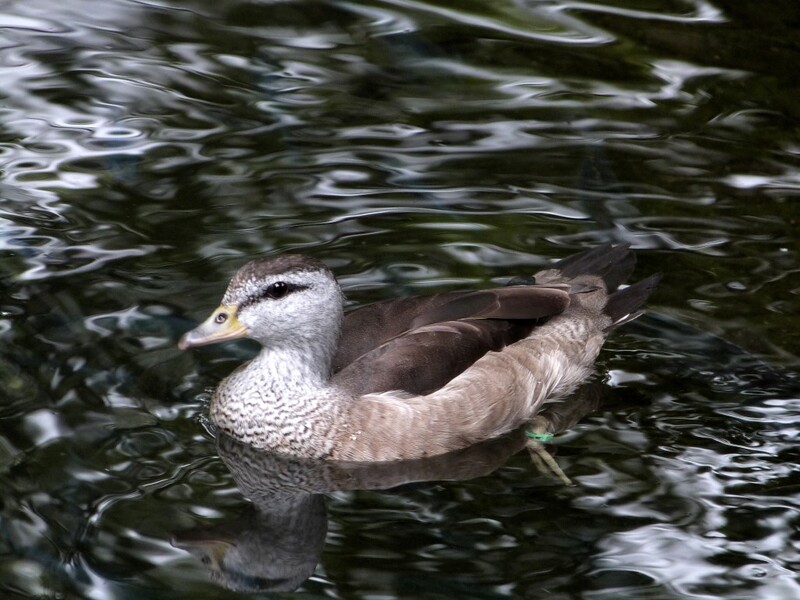 Blue Duck (Hymenolaimus malacorhynchos) is endemic to New Zealand. 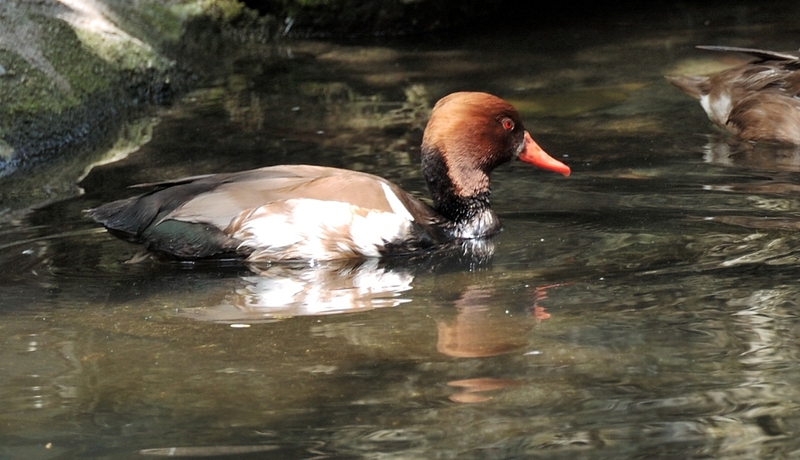 (Also known as “Whio”) It is the only member of the genus Hymenolaimus. 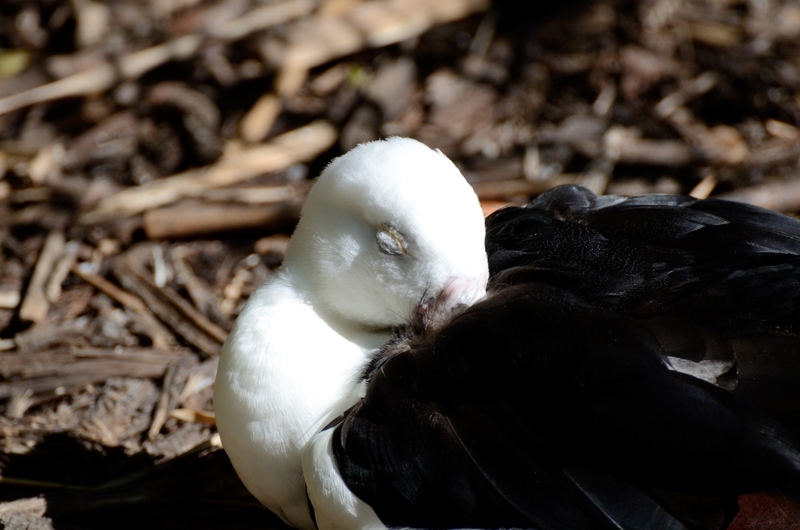 It is an endemic resident breeder in New Zealand, nesting in hollow logs, small caves and other sheltered spots. 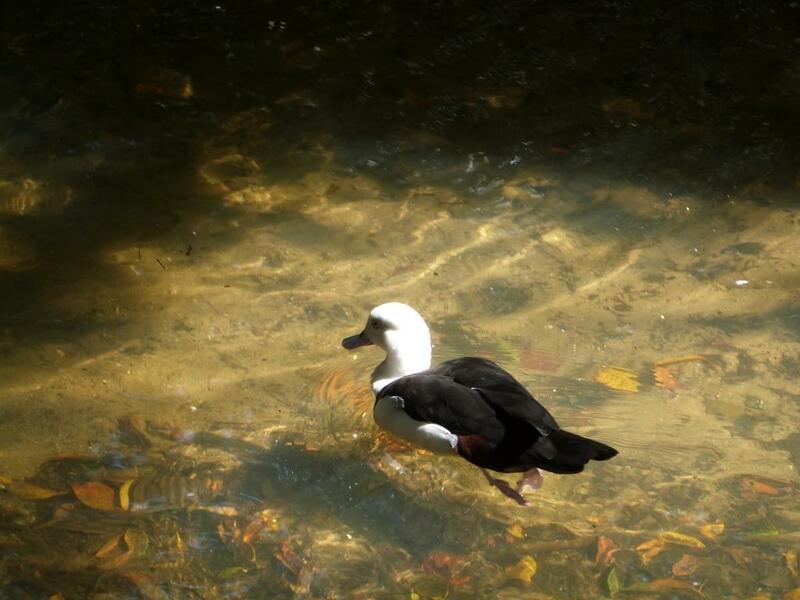 It is a rare duck, holding territories on fast flowing mountain rivers. 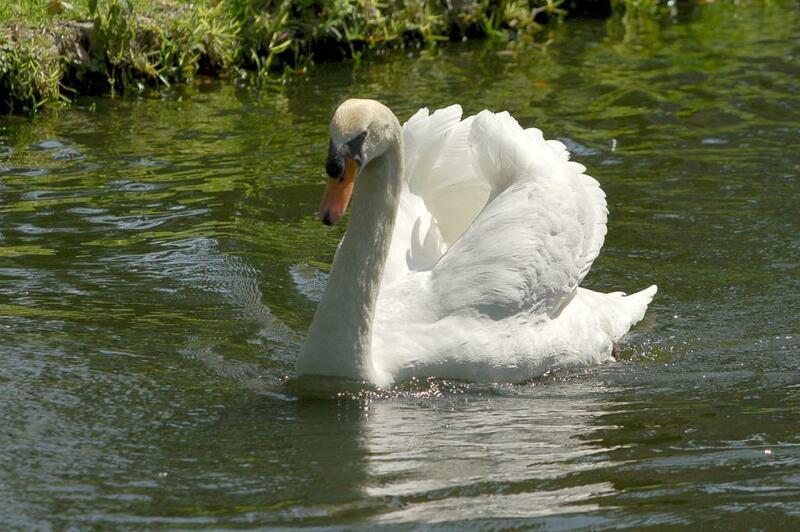 It is a powerful swimmer even in strong currents, but is reluctant to fly. It is difficult to find, but not particularly wary when located. 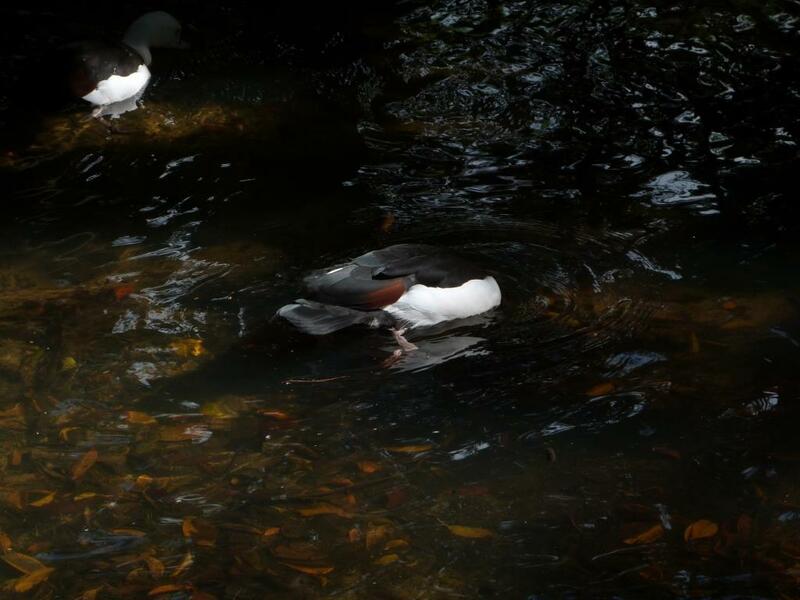 Captive North Island Whio are held and bred on both main islands of New Zealand, but the progeny are returned to their respective island. 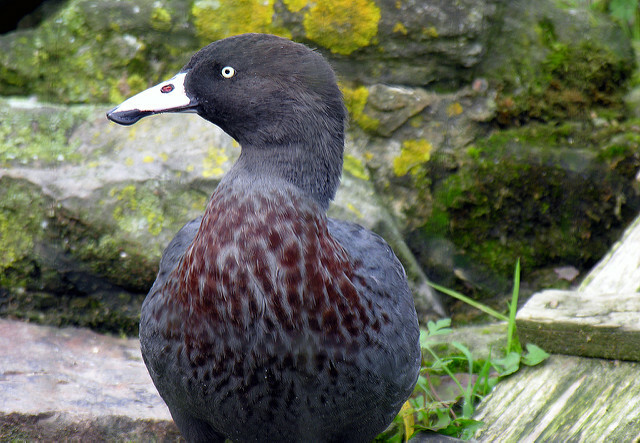 South Island whio are held and bred in captivity on the South Island only. All captives are kept by approved and permitted zoological and wildlife facilities as part of the national recovery plan. As part of this current ten-year plan (2009-2019) is the WHIONE program which works with specially trained nose dogs to locate nests. The eggs removed and ducklings hatched and raised in captivity. Later they are conditioned for coordinated release. Sounds like they are continuing the Genesis mandate. (Genesis 1:26-28) * The blue duck is depicted on the reverse side of the New Zealand $10 banknote. 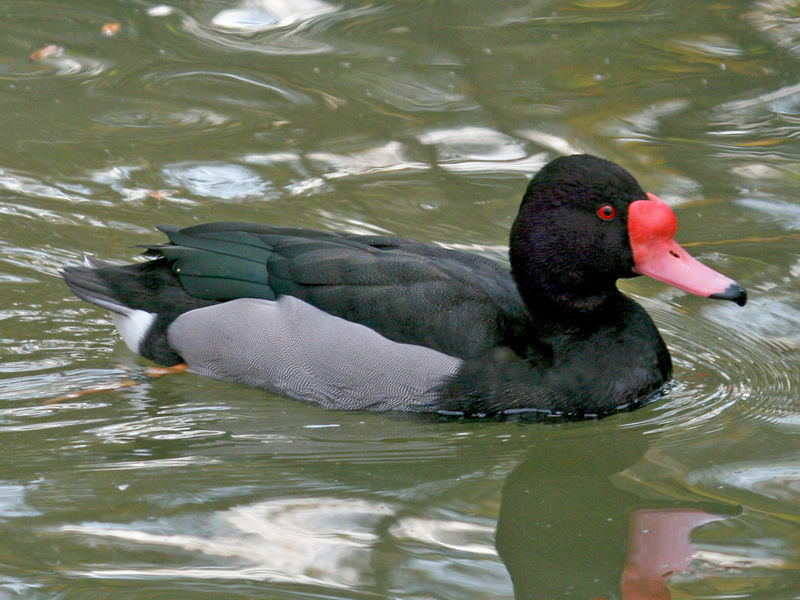 The Steamer Ducks are a genus (Tachyeres) of ducks in the family Anatidae. 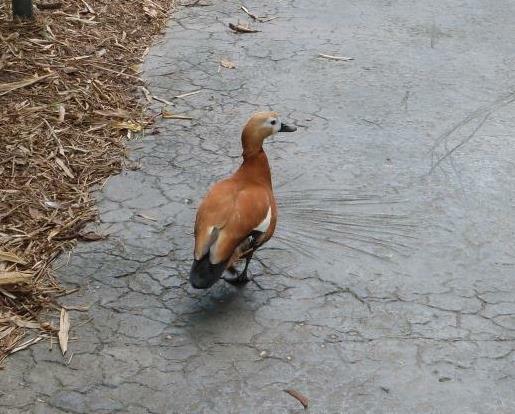 All of the four species occur at the southern cone of South America in Chile and Argentina, and all except the Flying Steamer Duck are flightless; even this one species capable of flight rarely takes to the air. The genus name Tachyeres, “having fast oars” or “fast rower”, comes from Ancient Greek ταχυ- “fast” + ἐρέσσω “I row (as with oars)”. The common name “steamer ducks” arose because, when swimming fast, they flap their wings into the water as well as using their feet, creating an effect like a paddle steamer. They can be aggressive and are capable of chasing off predators like petrels. 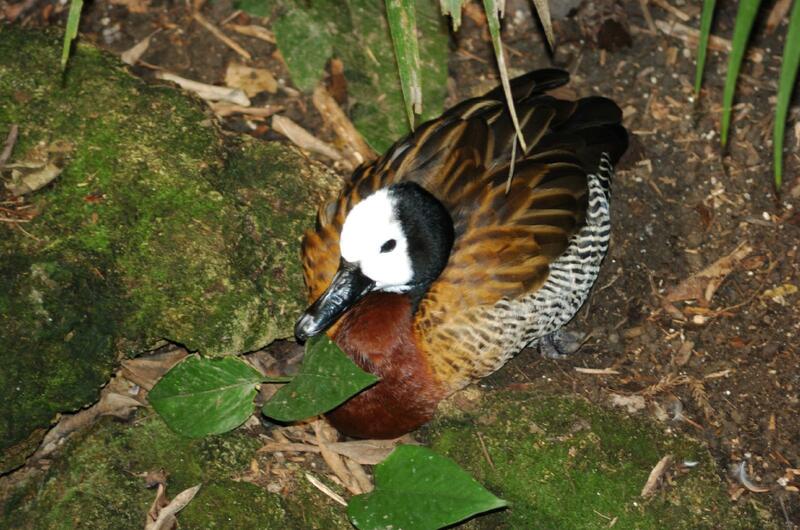 Torrent Duck (Merganetta armata) is the only member of the genus Merganetta. 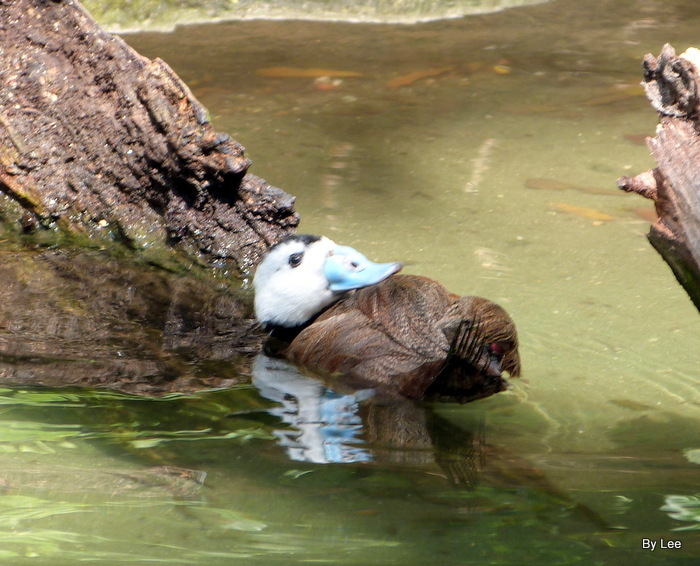 Its closest relative may be the blue duck of New Zealand. This 43–46-centimetre (17–18 in) long species is a resident breeder in the Andes of South America, nesting in small waterside caves and other sheltered spots. 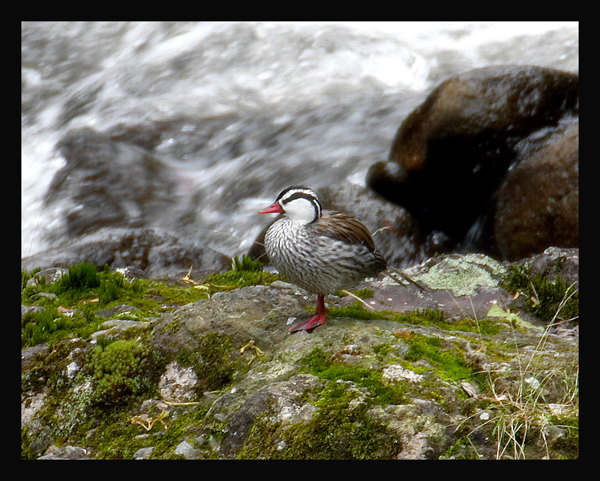 Like the blue duck, it holds territories on fast flowing mountain rivers, usually above 1,500 metres (4,900 ft). It is a powerful swimmer and diver even in white water, but is reluctant to fly more than short distances. It is not particularly wary when located. 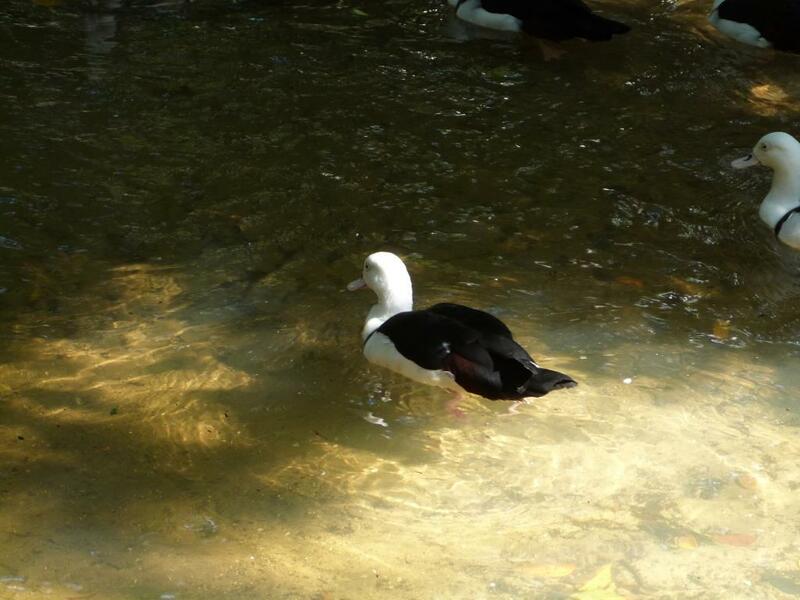 Male torrent ducks have a striking black and white head and neck pattern and a red bill. In flight they show dark wings with a green speculum. 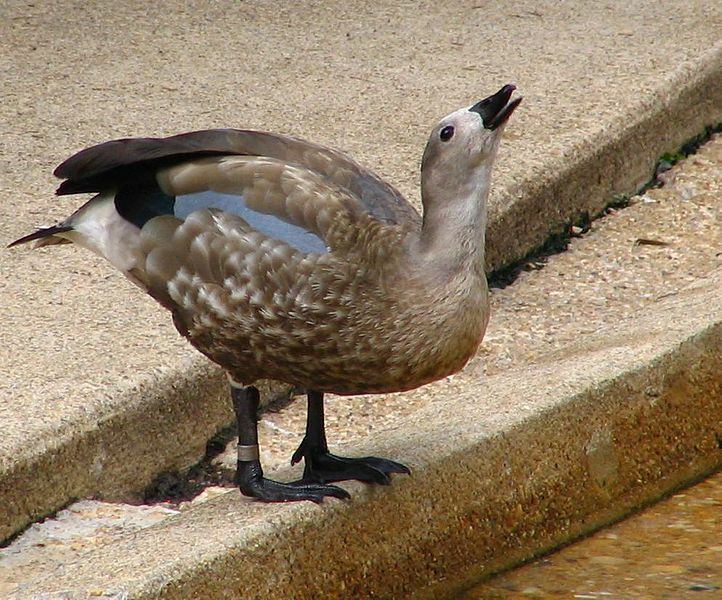 Females of all subspecies are somewhat smaller than the drakes; they have orange underparts and throat, with the head and upperparts grey and a yellower bill. Juveniles are pale grey above and whitish below. 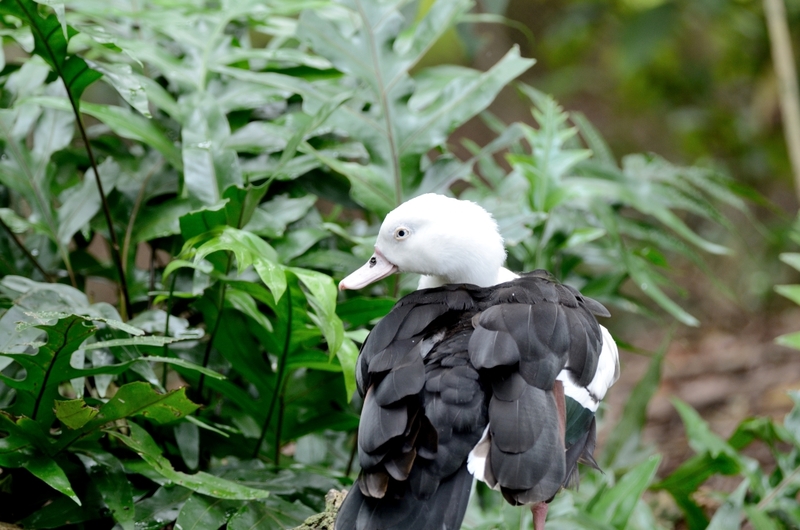 Spur-winged Goose (Plectropterus gambensis) is a large bird in the family Anatidae, related to the geese and the shelducks, but distinct from both of these in a number of anatomical features, and therefore treated in its own subfamily, the Plectropterinae. It occurs in wetlands throughout sub-Saharan Africa. Adults are 75–115 cm (30–45 in) long and weigh on average 4–6.8 kg (8.8–15.0 lb), rarely up to 10 kg (22 lb), with males noticeably larger than the females. The wingspan can range from 150 to 200 cm (59 to 79 in). 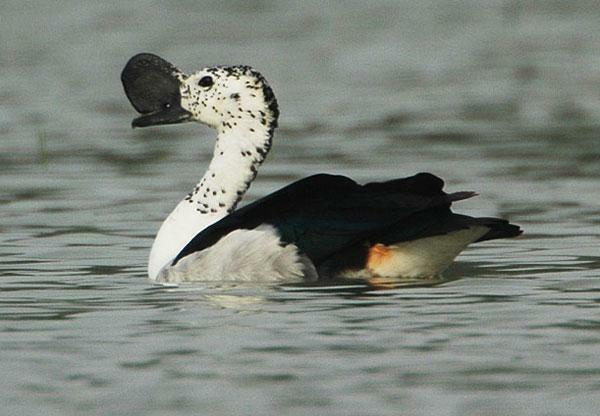 Comb Duck (Sarkidiornis sylvicola) and Knob-billed Duck (Sarkidiornis melanotos) are an unusual, pan-tropical duck, found in tropical wetlands in sub-Saharan Africa, Madagascar and south Asia from Pakistan to Laos and extreme southern China. It also occurs in continental South America south to the Paraguay River region in eastern Paraguay, southeastern Brazil and the extreme northeast of Argentina, and as a vagrant on Trinidad. These were subspecies that have both been raise to full species status. These common species are unmistakable. 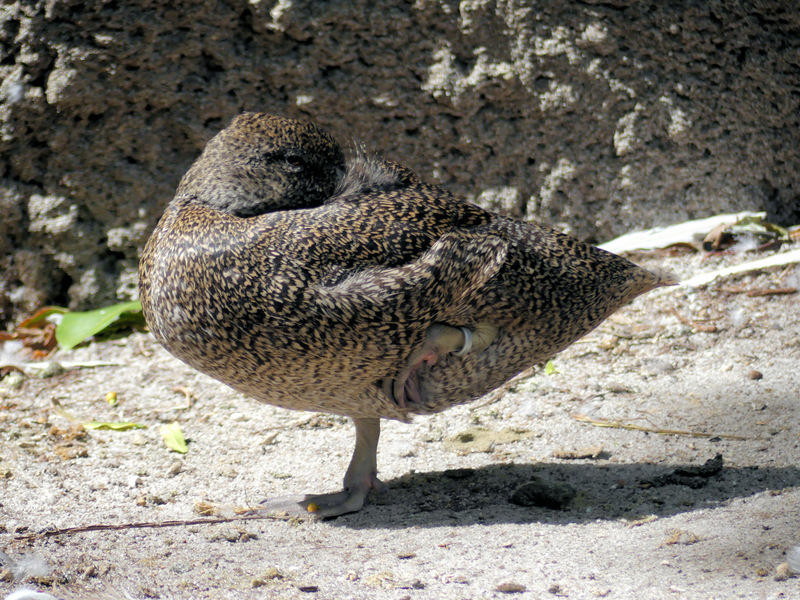 One of the largest species of duck. Length can range from 56 to 76 cm (22 to 30 in), wingspan ranges from 116 to 145 cm (46 to 57 in) and weight from 1.03 to 2.9 kg (2.3 to 6.4 lb). Adults have a white head freckled with dark spots, and a pure white neck and underparts. 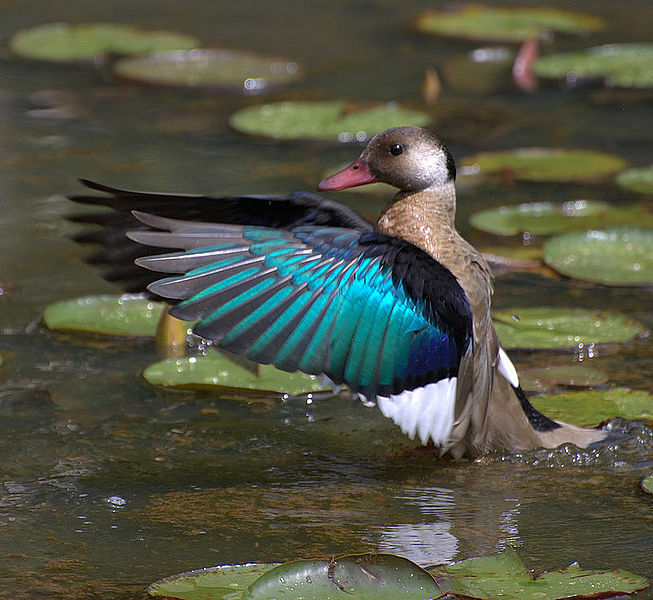 The upperparts are glossy blue-black upperparts, with bluish and greenish iridescence especially prominent on the secondaries (lower arm feathers). The male is much larger than the female, and has a large black knob on the bill. Young birds are dull buff below and on the face and neck, with dull brown upperparts, top of the head and eyestripe. 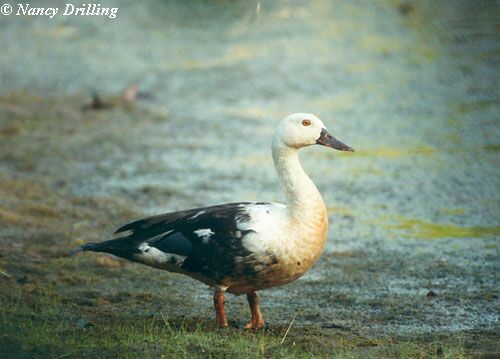 Blue-winged Goose (Cyanochen cyanoptera) is a waterfowl species which is endemic to Ethiopia. It is the only member of the genus Cyanochen. This is a stocky grey-brown bird about 70 centimetres (28 in) long with a slightly paler head and upper neck. It has a small black bill and black legs. In flight, this species shows a pale blue forewing. Sexes are similar, but immature birds are duller. The plumage of these birds is thick and loose, furlike as an adaptation to the cold of the Ethiopian highlands. It feeds by grazing, and is apparently largely nocturnal, loafing during the day. 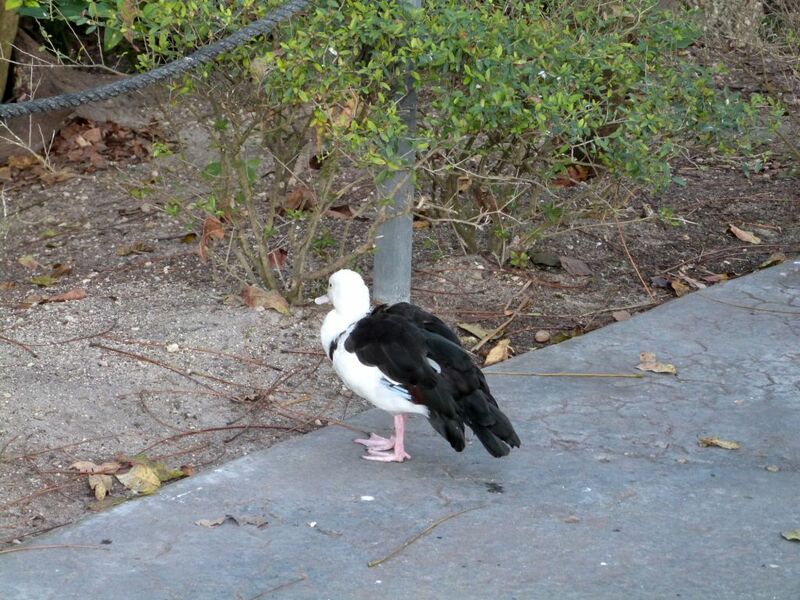 It can swim and fly well, but this terrestrial bird is reluctant to do either, and is quite approachable. It forms flocks outside the breeding season. It breeds by mountain lakes and streams. 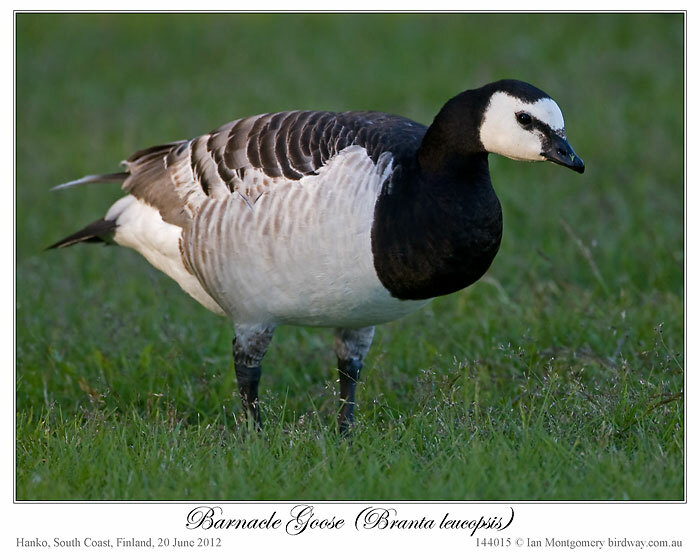 This little-known species is believed to build a lined nest amongst grass tussocks, and to lay 6–7 eggs. 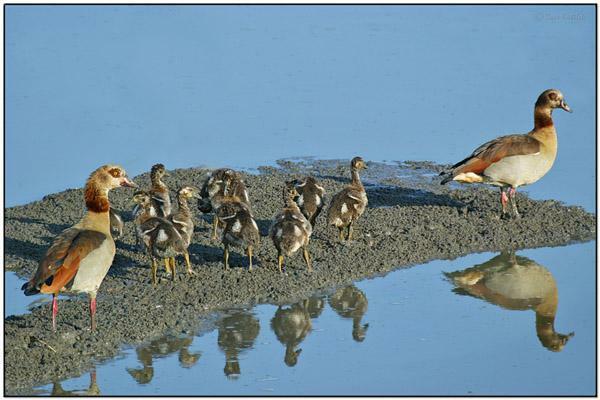 The Egyptian Goose (Alopochen aegyptiacus) is native to Africa south of the Sahara and the Nile Valley. 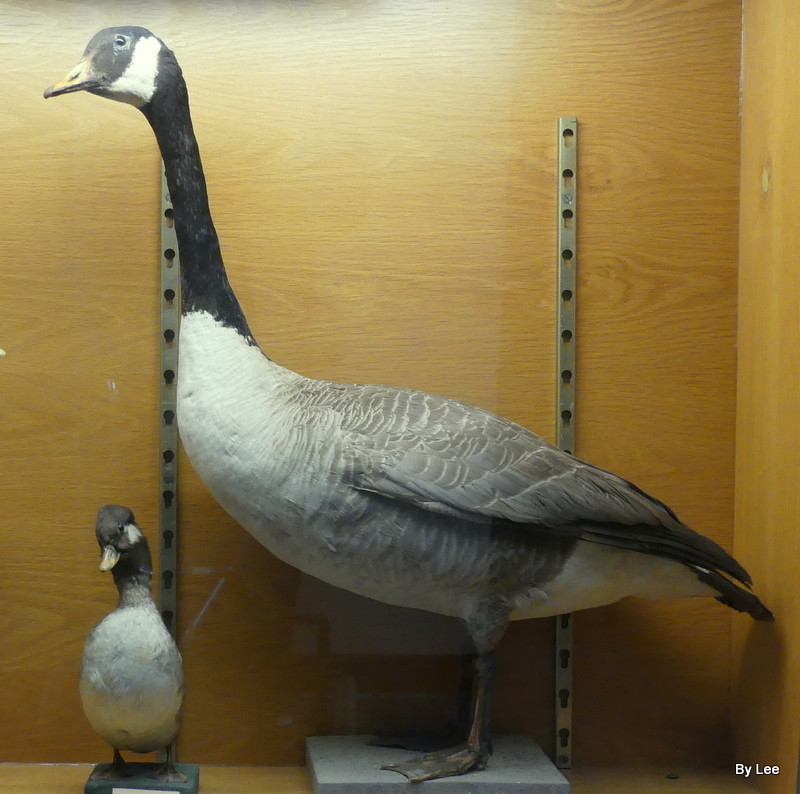 The other two species, Mauritius Sheldgoose (Alopochen mauritiana) became extinct in 1698 and Reunion Sheldgoose (Alopochen kervazoi) was extinct in the 1690’s. Both were over hunted. 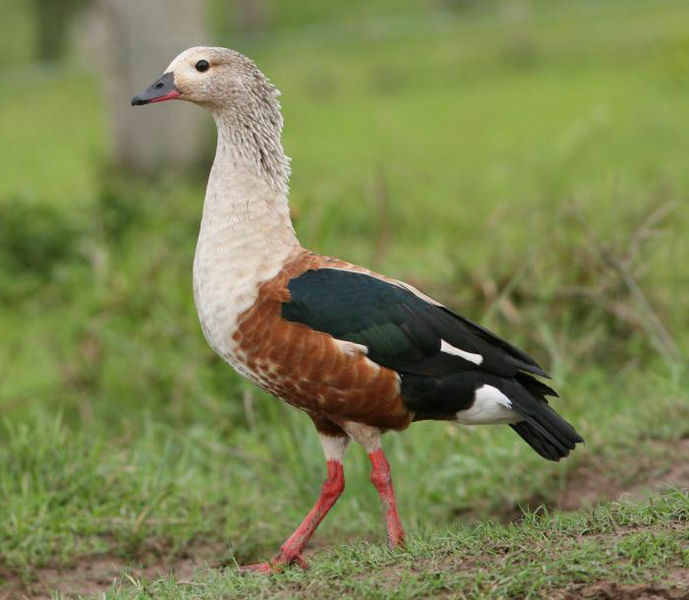 Orinoco Goose (Neochen jubata) are 61 to 76 cm (24 to 30 in) long and are resident breeders in the forests of tropical South America. Its preference is forest lakes or marshes with access to open woodland or savanna. This is a largely terrestrial species, which will also perch readily in trees. It rarely swims or flies unless hard pressed. In flight it looks heavy, more like a goose than a duck, hence the English name. 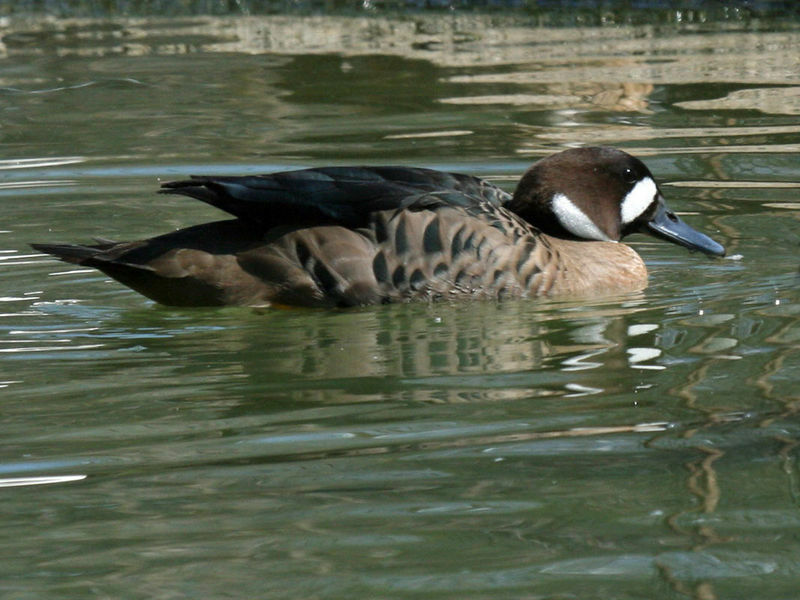 It has a pale head and neck, chestnut flanks and mantle and blackish wings with a white speculum. The legs are red and the bill is black and pinkish. 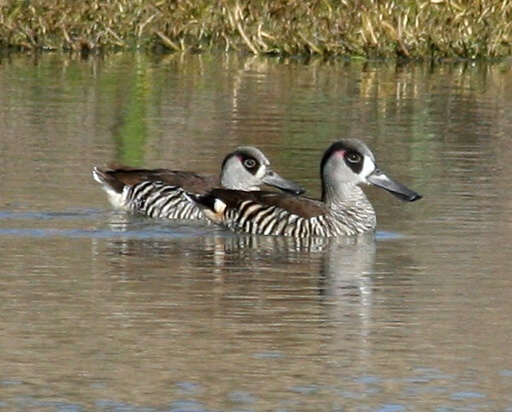 The sexes of this striking species are identical in plumage, though the males are larger; juveniles have duller plumage than adults. 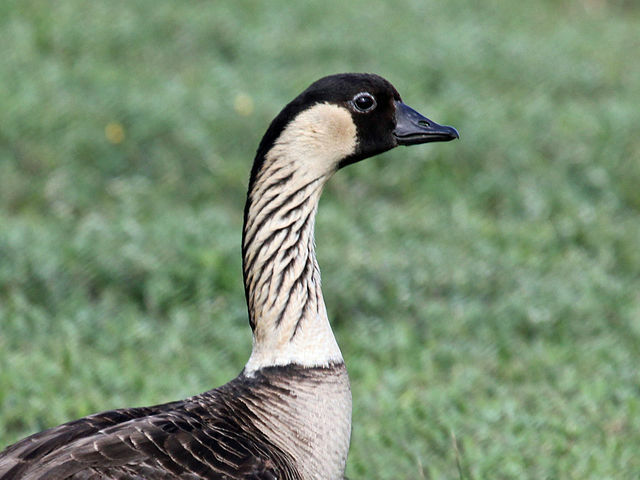 The Chloephaga genus is made up of these Geese all from South America. 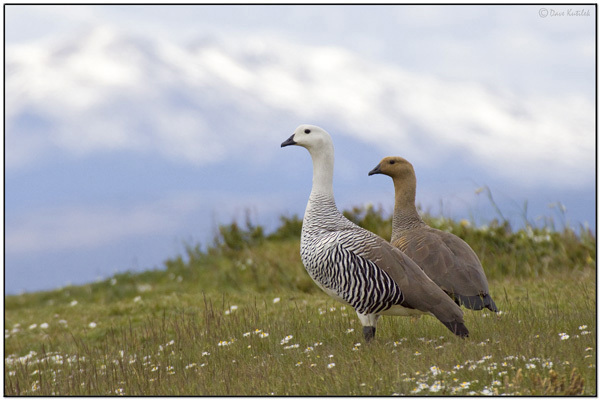 The Andean Goose (Chloephaga melanoptera), Upland Goose (Chloephaga picta), Kelp Goose (Chloephaga hybrida), Ashy-headed Goose (Chloephaga poliocephala), and the Ruddy-headed Goose (Chloephaga rubidiceps). They are considered part of the Sheldgeese subfamily. 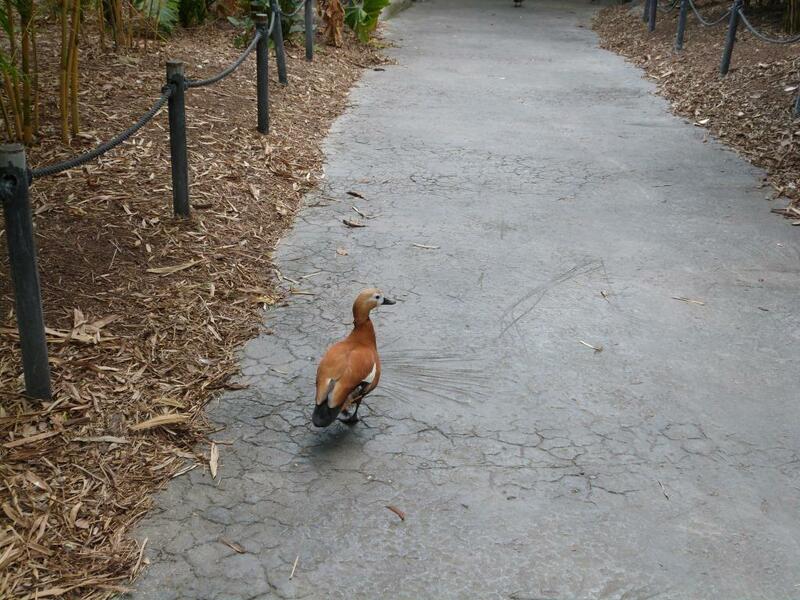 We keep encountering Whistling Ducks as we visit the zoos and as we go birdwatching, especially at Circle B Bar Reserve. 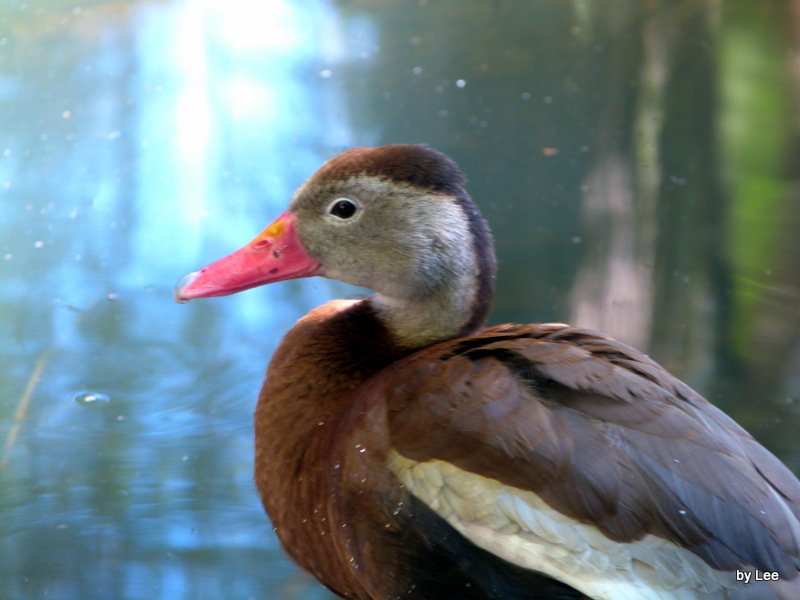 There we get to see the Black-bellied Whistling Ducks quite frequently. 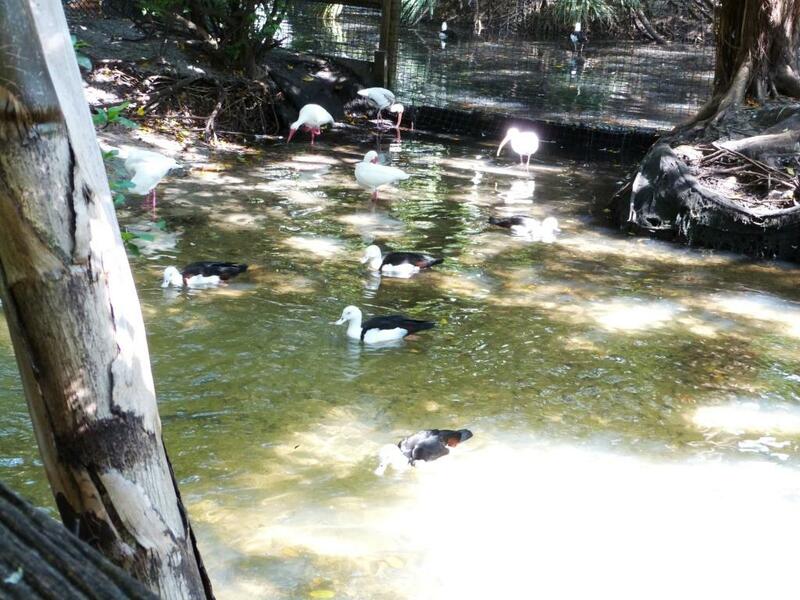 At Palm Beach Zoo, I got tickled at the feet of the Black-bellieds. 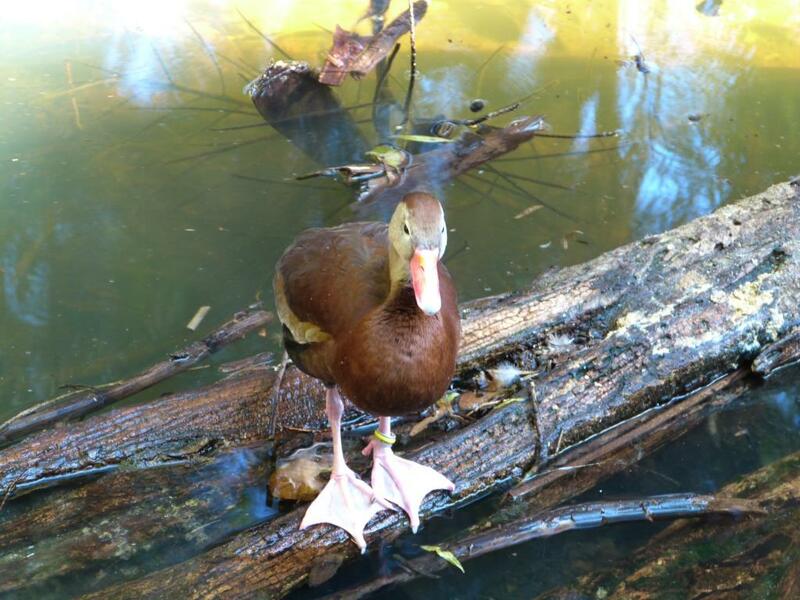 This week at Lowry Park Zoo, we took photos of their Spotted Whistling Duck which are fairly new residents. I checked the e-Sword Bible program and can not find any “Ducks” or “Waterfowl” in Scripture by name, only in references to all birds being created, etc. They are still neatly created birds and are a joy to watch. There are three verses that refer to a “whistle” and in all of them it is the Lord who is doing the whistling. 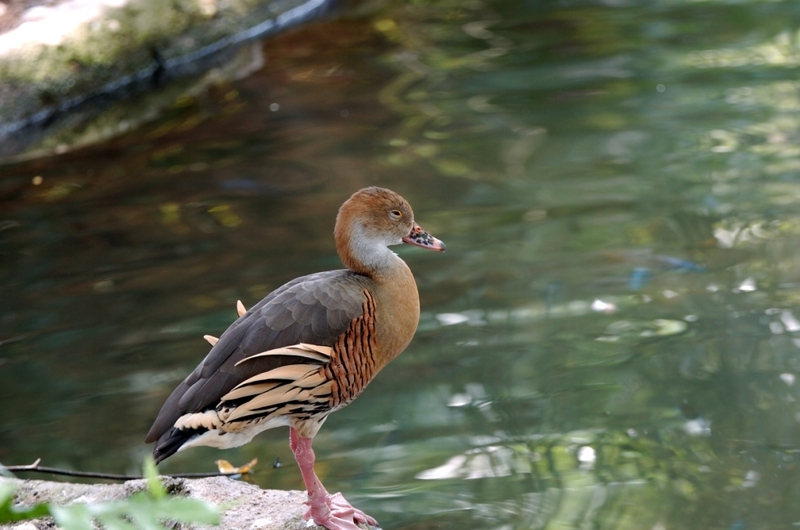 The first whistling ducks were described by Carl Linnaeus in the 10th edition of Systema Naturae in 1758: the Black-bellied Whistling Duck (then Anas autumnalis) and the West Indian Whistling Duck (then Anas arborea). 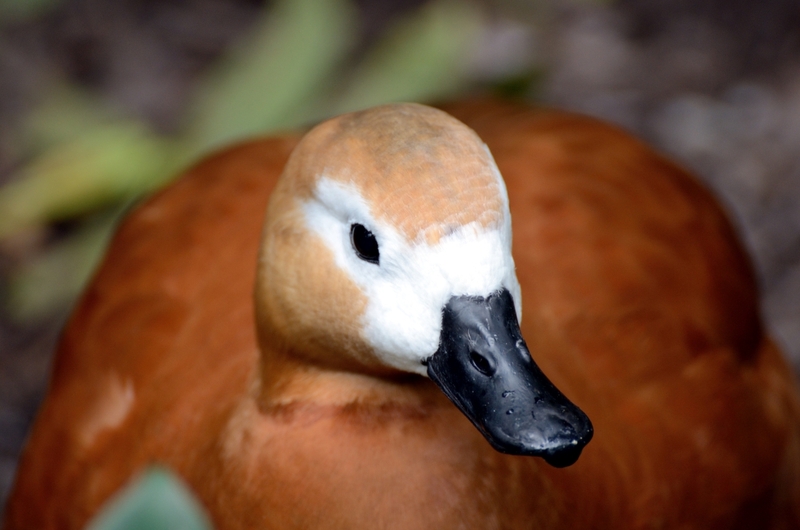 In 1837, William John Swainson named the genus Dendrocygna to distinguish whistling ducks from the other waterfowl. 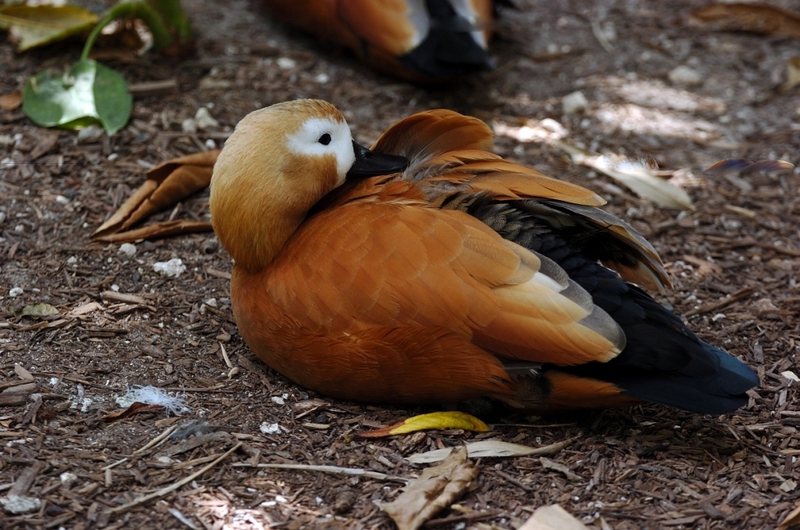 The whistling ducks or tree ducks are a subfamily, Dendrocygninae of the duck, goose and swan family of birds, Anatidae. They are not true ducks. In other taxonomic schemes, they are either considered a separate family Dendrocygnidae, or a tribe Dendrocygnini in the goose subfamily Anserinae. 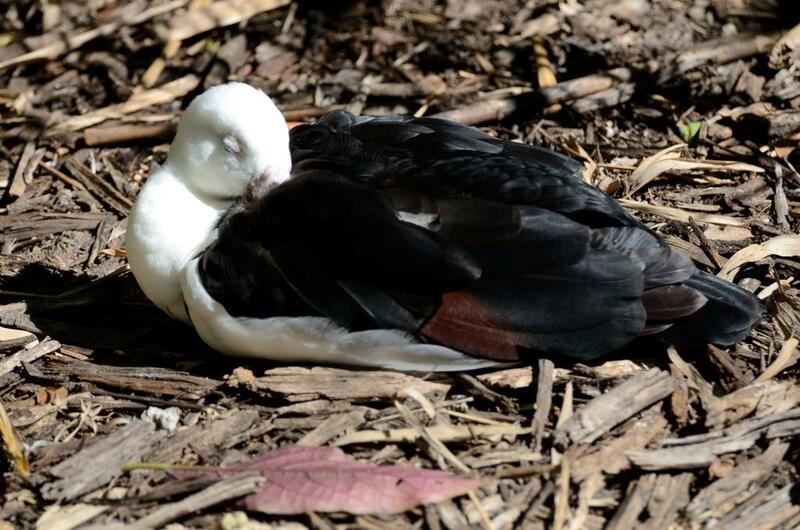 The subfamily has one genus, Dendrocygna, which contains eight living species, and one undescribed extinct species from Aitutaki of the Cook Islands. Several friends have inquired how I got on with the quest for Freckled Duck photos a fortnight ago, so here it is as bird of the week as it’s a rare and unusual duck, even if these ones didn’t want to cooperate in the portrait photo category. There were perhaps a dozen or more at the reported site of Hasties Swamp just south of Atherton town, but only two came within cooee of the hide and spent most of the day sitting on this log. Note the diagnostic ski-jump-shaped bill and the slight peak on the head of the bird on the end of the log. 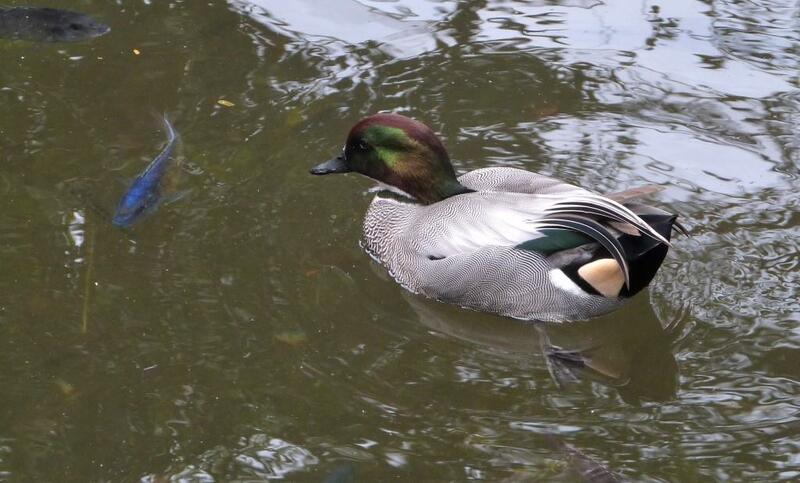 The duck beside this one is a Hardhead, so they’re approximately the same size. 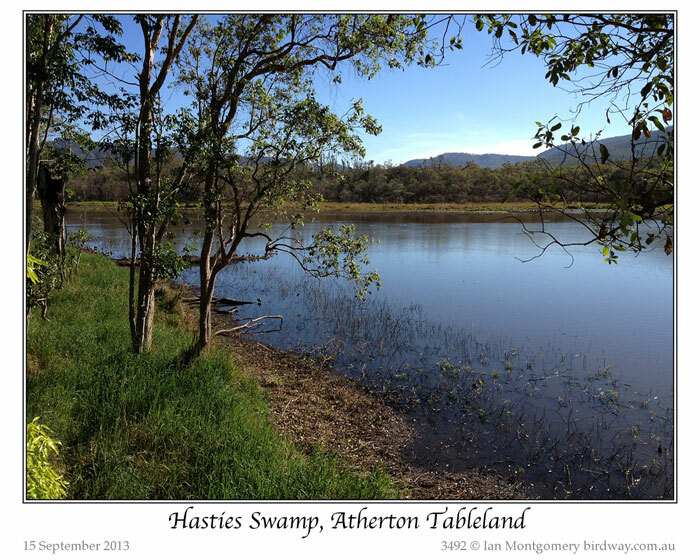 It was a lovely day at Hasties (second photo), so it was no hardship loafing there waiting for the ducks to do something. The log the ducks liked is the farther one in this photo, but this was taken with my phone and makes it look farther away than it actually is. It’s a two storey hide, and this was taken from the upper deck, though I spent most of the time downstairs. 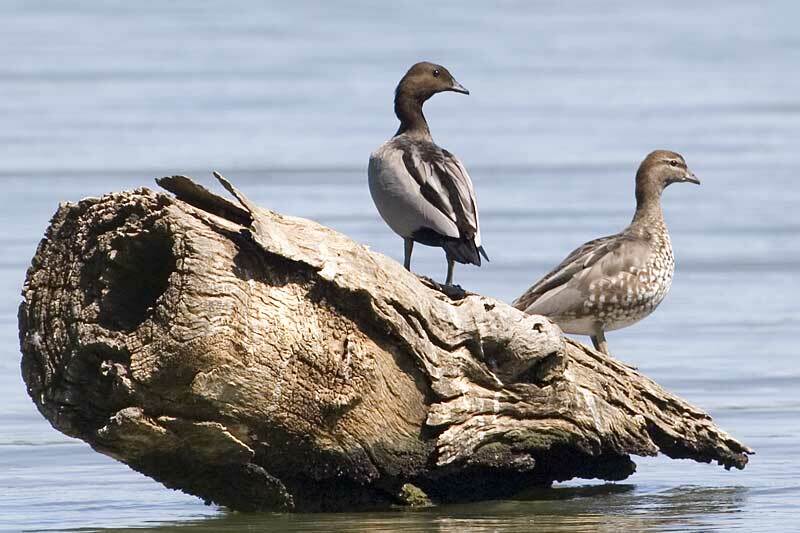 The log was popular with various species of ducks including Pacific Blacks and Grey Teal, so the Freckled Ducks, all in non-breeding garb were easy to overlook. Very occasionally, one of the ducks would swim over to a smaller log (hidden behind the branch in the second photo) and peck at a coot if it came too close. You can see the coot in the third photo. Sometimes it would swim away to feed, but always on the other side of the log. In the fourth photo it is maybe contemplating such a foray, and is testing the water behind one of several Nankeen Night-Herons that came out to feed in the late afternoon – apparently they roost in the trees near the hide. 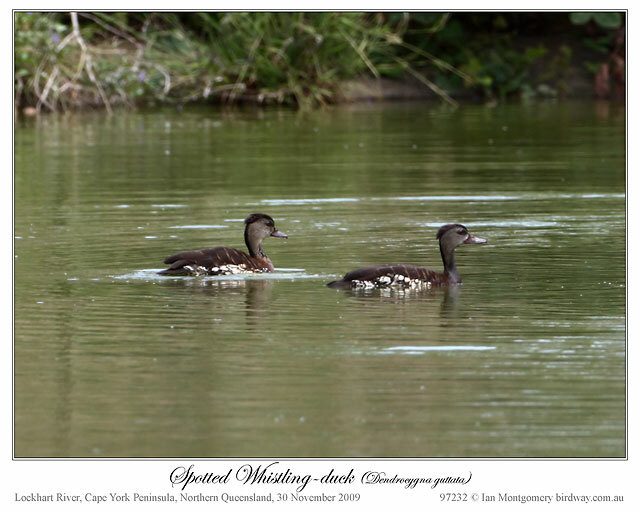 The fifth photo shows a distant pair of Freckled Ducks thirteen years ago in breeding condition at Werribee in Victoria and you can see the characteristic red colour of the male. The peaks look more conspicuous on both sexes, but I don’t know whether these feathers grow longer then or whether they are erectile. 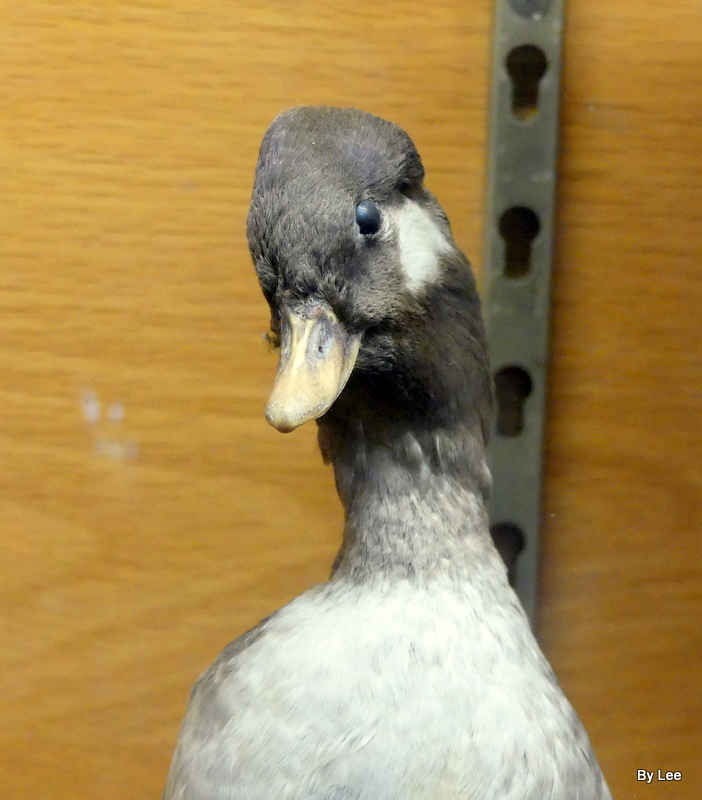 So why is this rather drab duck so interesting to both birders and avian taxonomists? Firstly, it’s endemic to Australia and rare, particular in North Queensland. It’s main breeding range is in inland areas of New South Wales, Victoria, Southern Western Australia (an isolated population) and the channel country of Southwestern Queensland where breeding takes place in densely vegetated lakes and swamps, including lignum in more arid floodplains. When these areas dry out, the birds move to the coast, which is when they become easier to find. Presumably the birds currently in North Queensland (they’ve been reported in both Townsville and the Atherton Tableland) are from the Cooper’s Creek and Paroo River catchments. 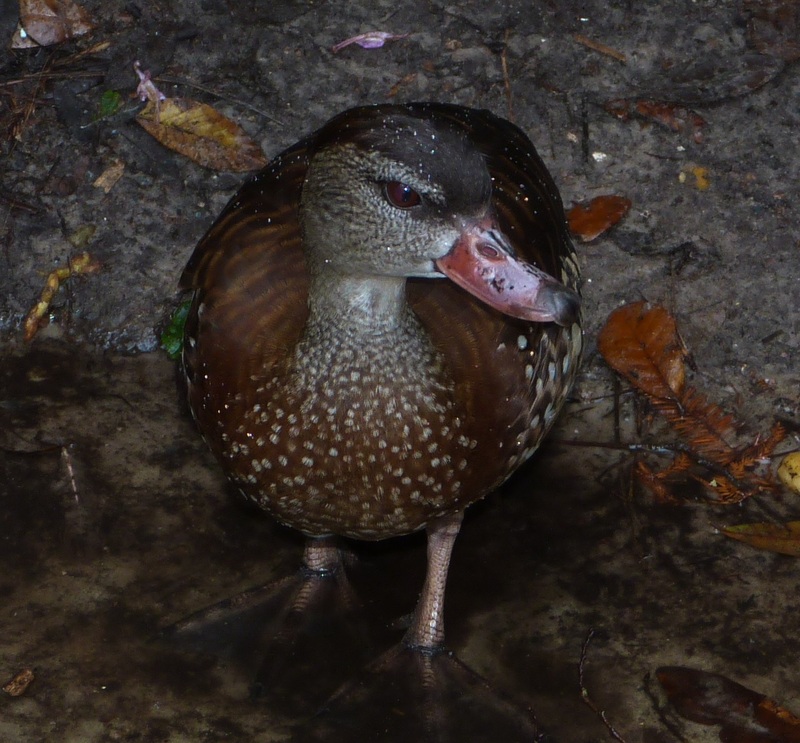 Secondly, taxonomists find the Freckled Duck interesting because it has no close relatives. 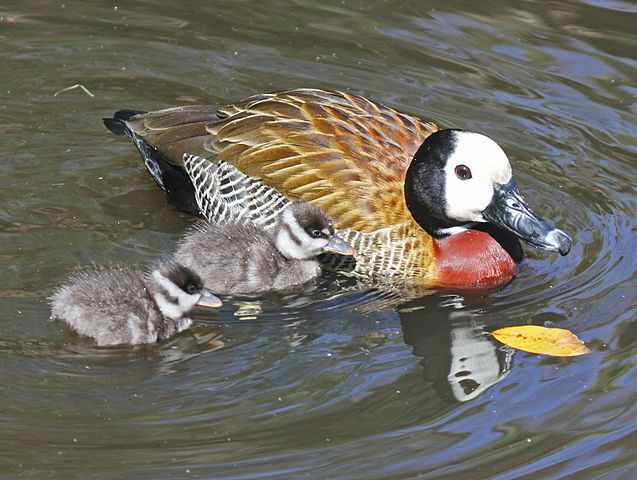 It is the only member of the genus Stictonetta and both morphological and DNA studies support placing it in own sub-family that diverged from other ducks and geese very early on. The name Stictonetta means ‘spotted duck’ in Greek and, in a case of tautological overkill, naevosa means ‘spot abundance’ in Latin. I was going to include a Snake of the Week but this is getting rather long, so I’ll hold it over till next time. What birdwatchers and photographers won’t go through to find those special and rare birds. 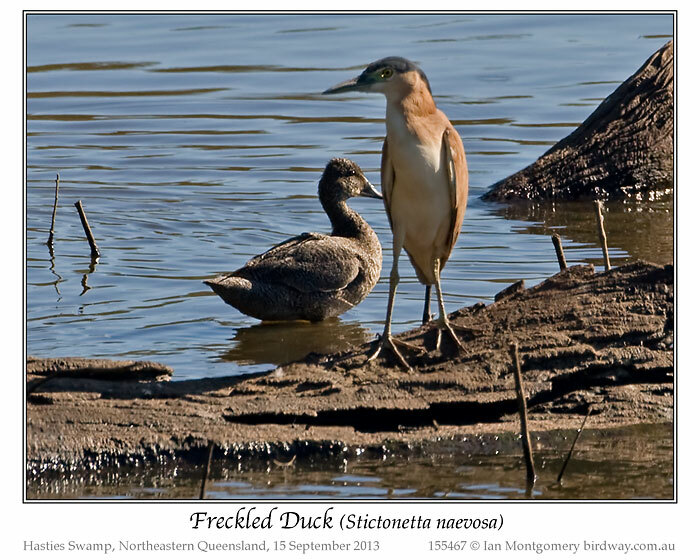 Thanks, Ian, for showing us yet another interesting member of the Anatidae – Ducks, Geese & Swans Family. I am so thankful that Ian is letting me share his newsletters here on this blog. We have been introduced to numerous birds we have never have heard of, let along seen. 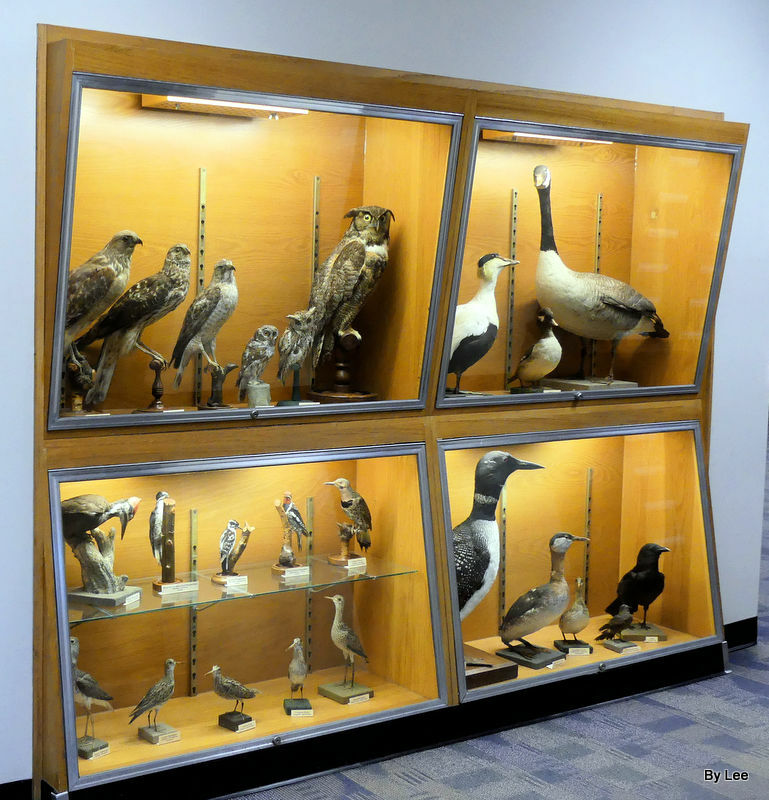 Check out all of Ian’s Anatidae Family photos. Here are a few more facts about this duck from Wikipedia. 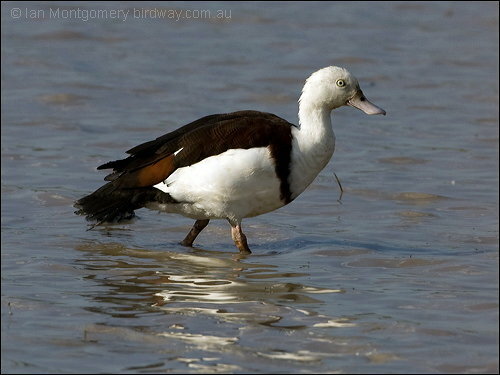 The Freckled Duck (Stictonetta naevosa) is a moderately large, broad-bodied duck native to southern Australia. The duck is protected by law. Dark in colour with fine off-white speckles all over, it is most easily identified by its large head with a peaked (as opposed to rounded) crown. In flight, it has a distinctive rapid wing beat and holds its head low, making it appear hunchbacked. It does not turn rapidly and lands clumsily.